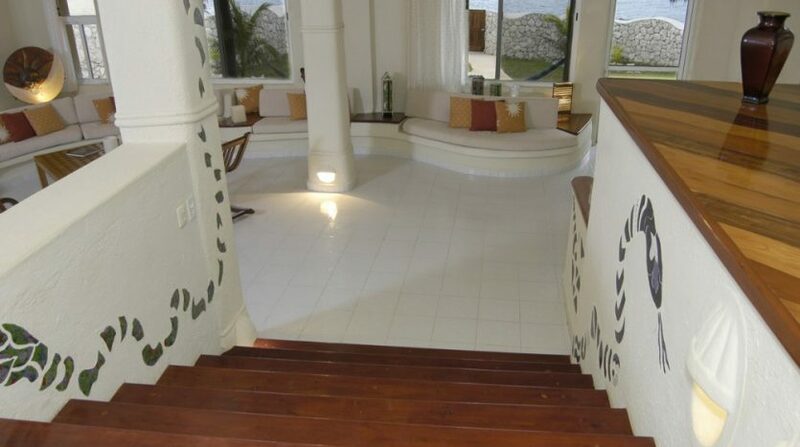 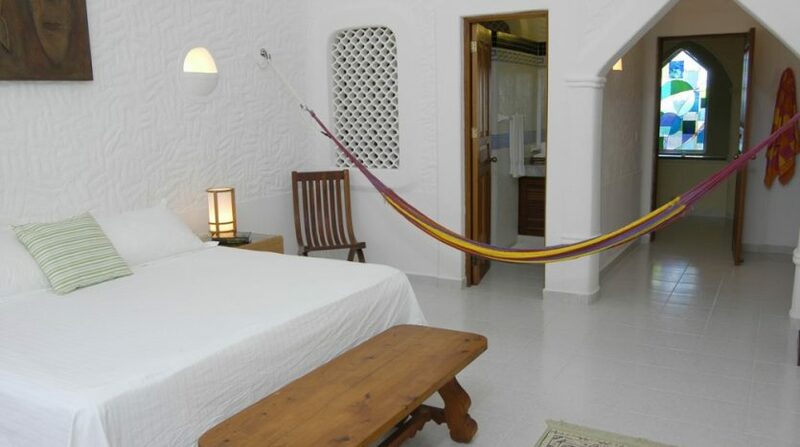 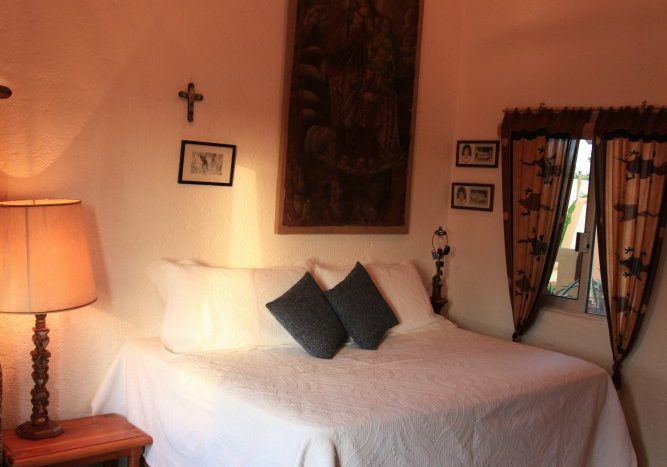 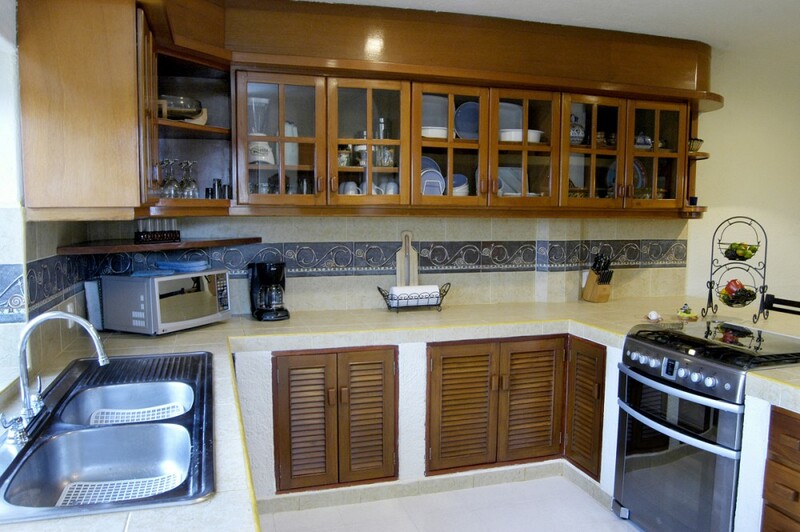 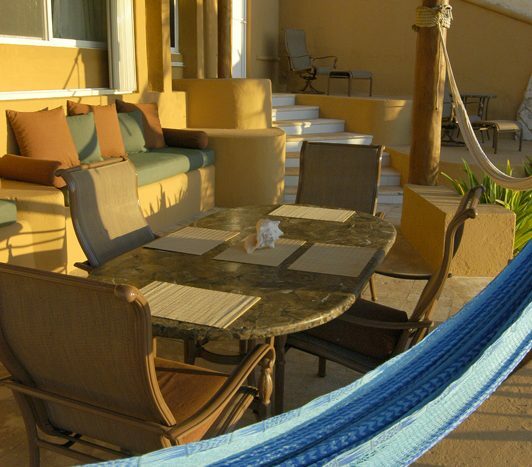 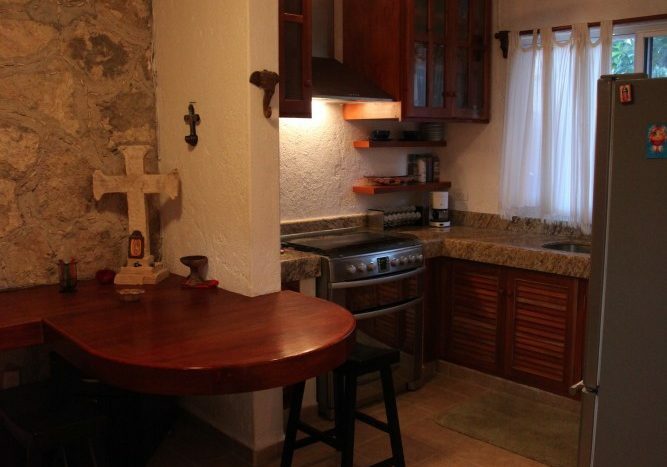 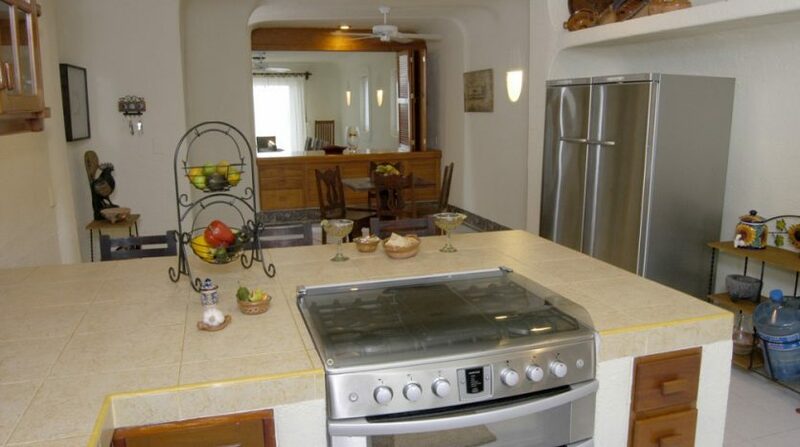 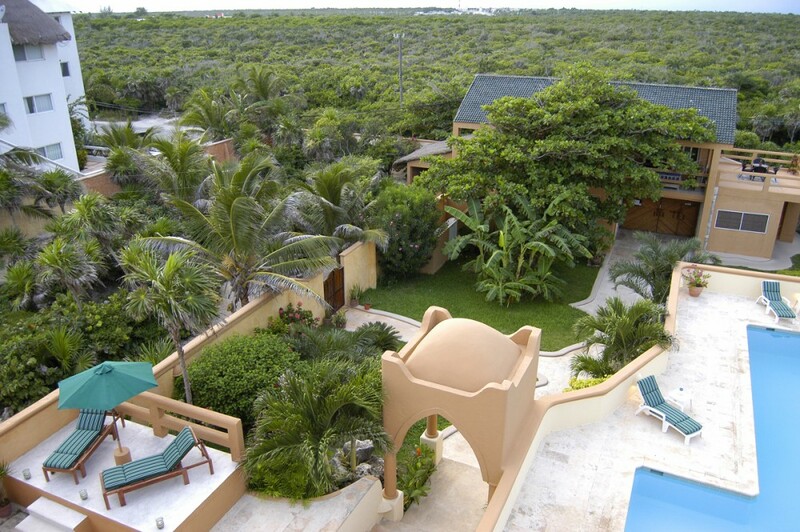 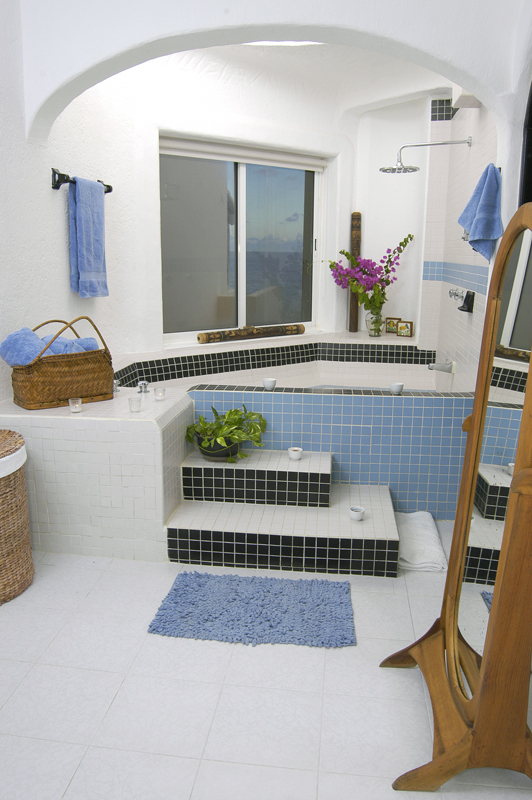 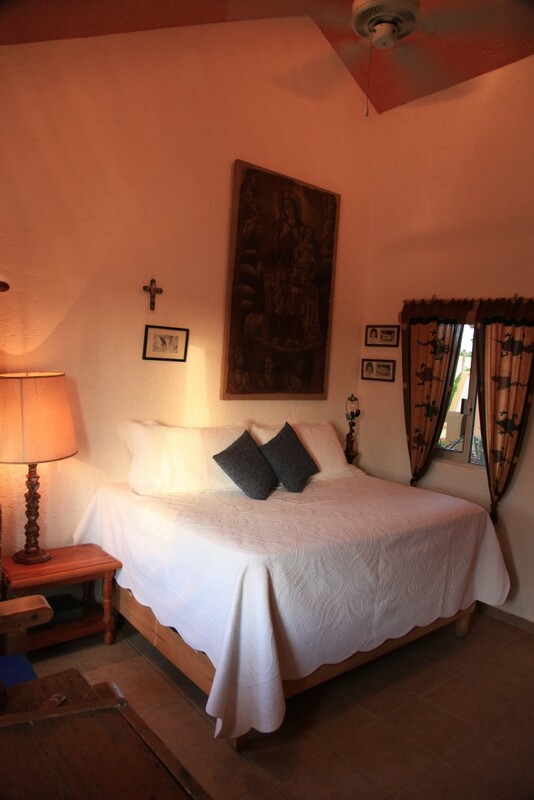 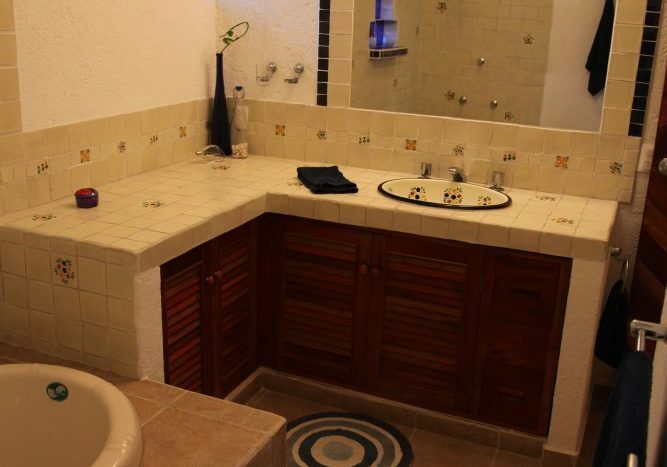 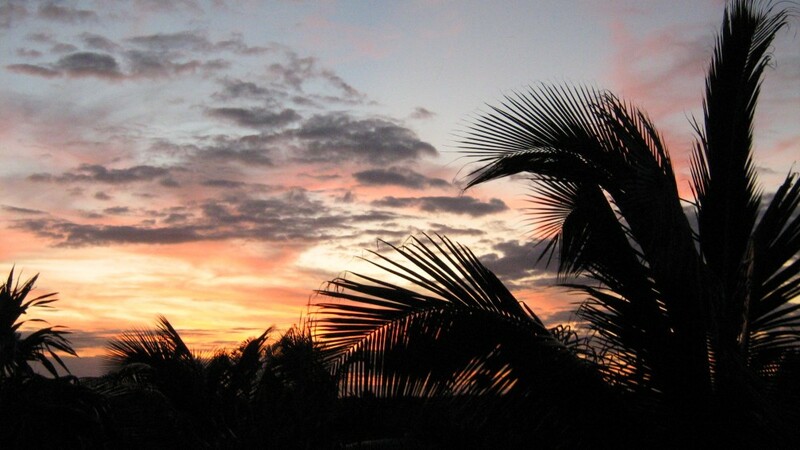 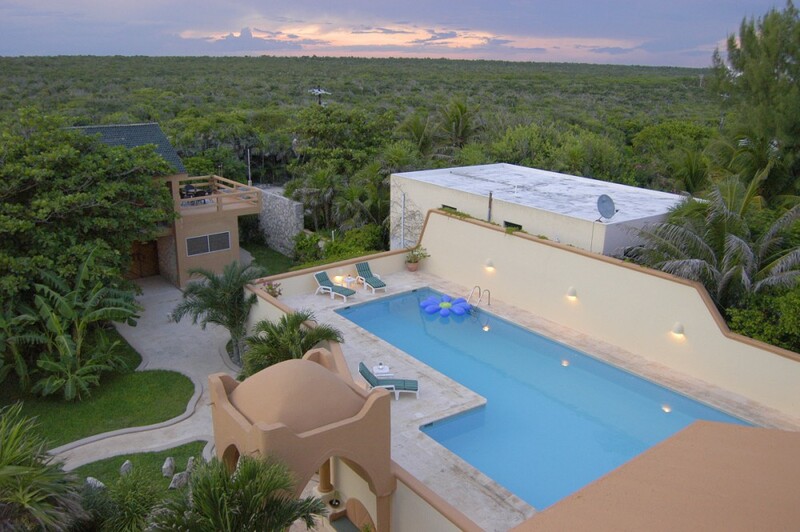 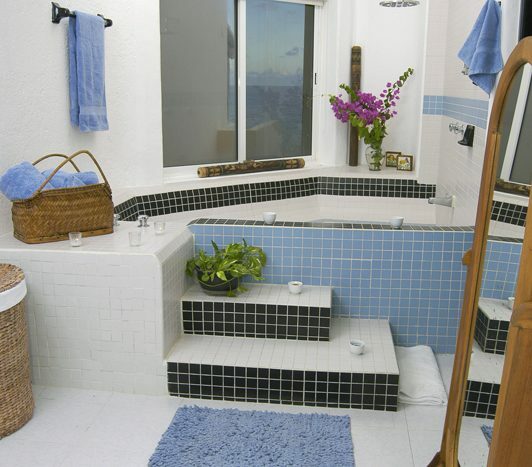 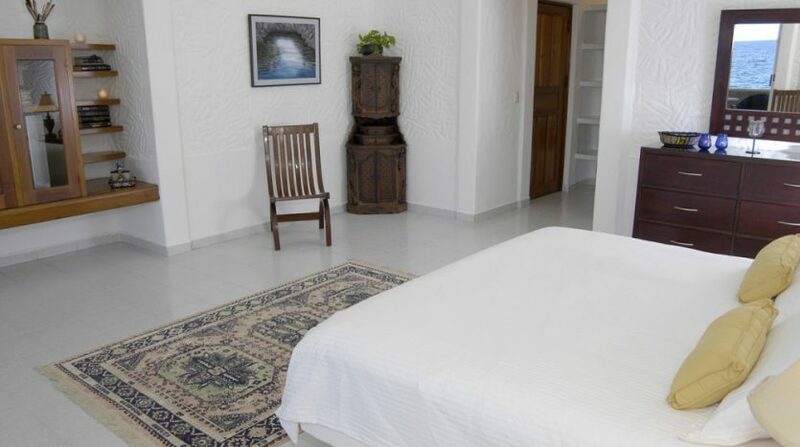 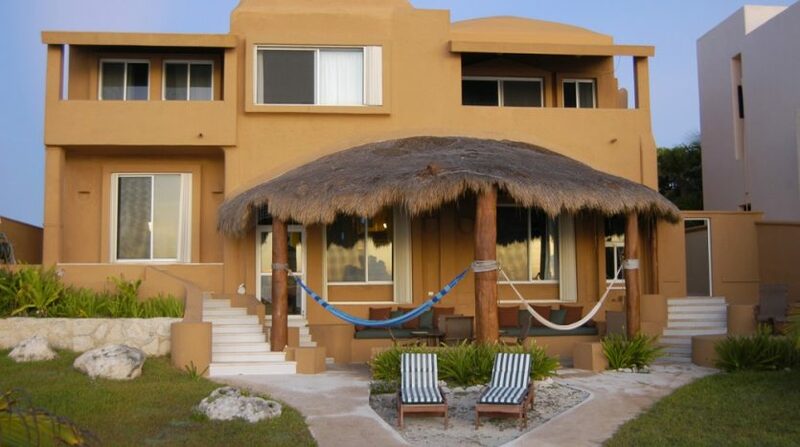 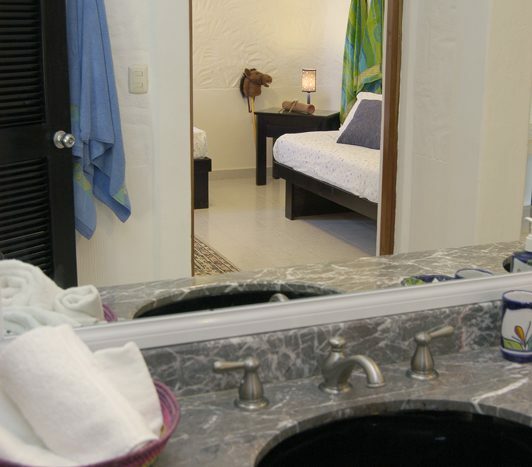 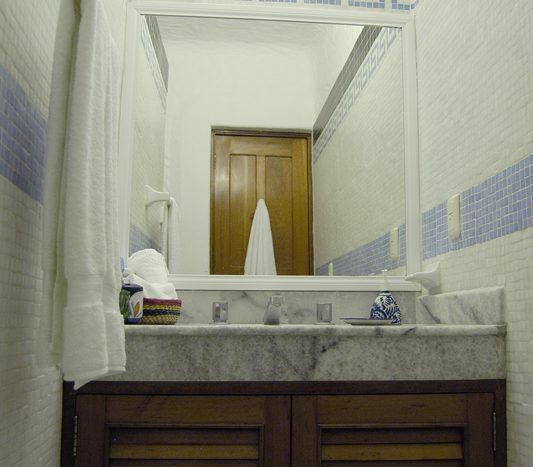 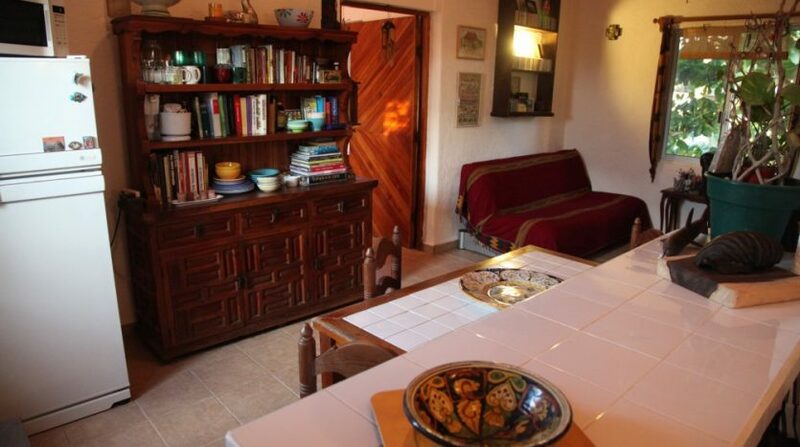 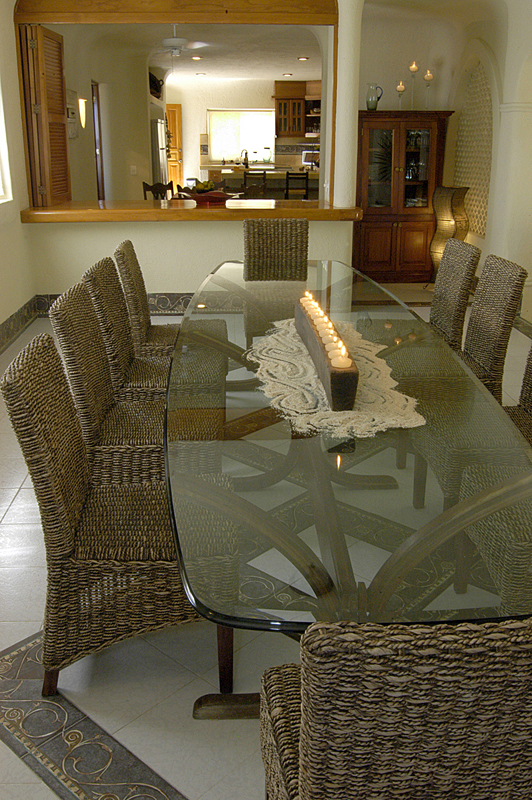 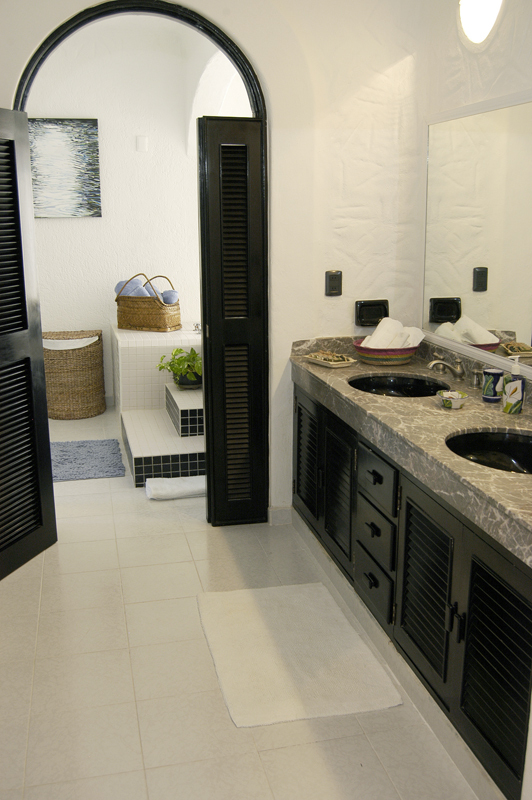 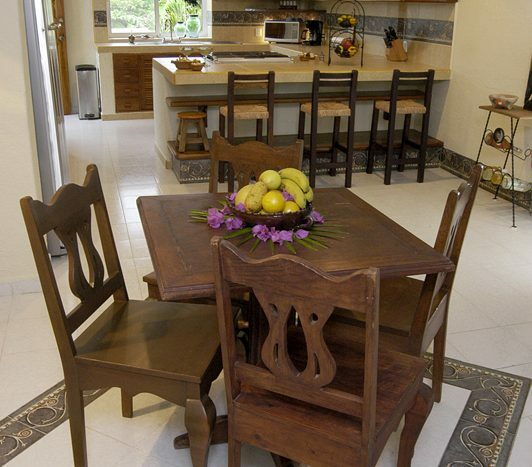 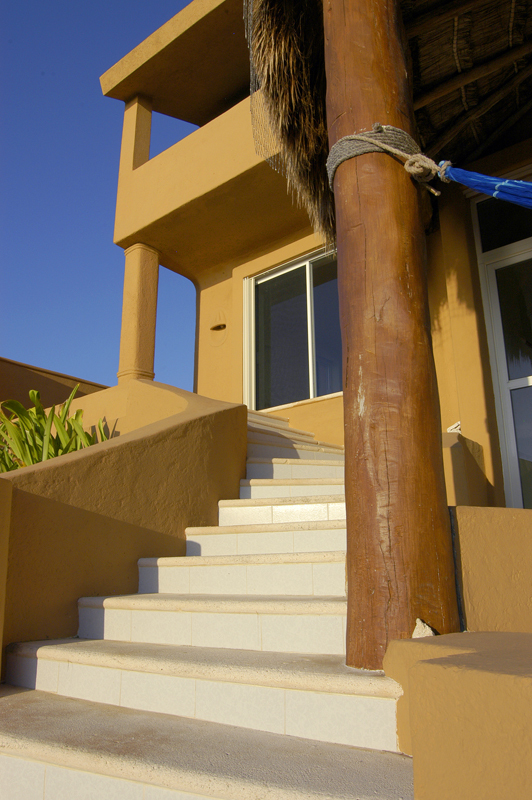 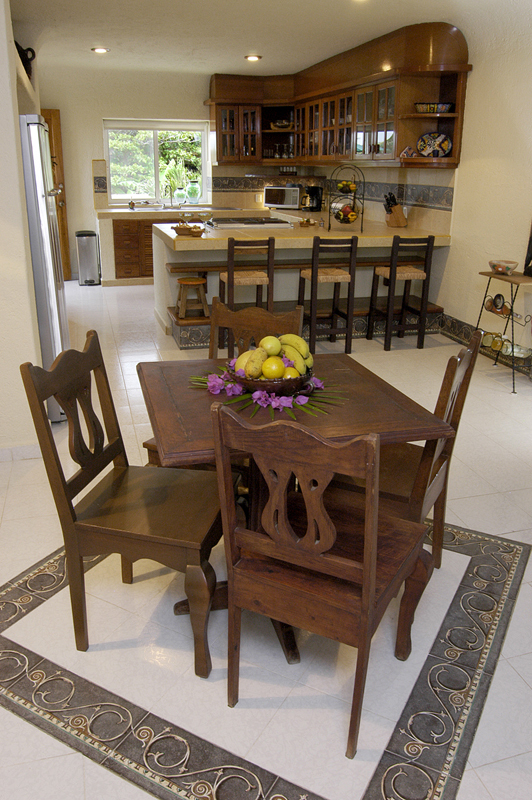 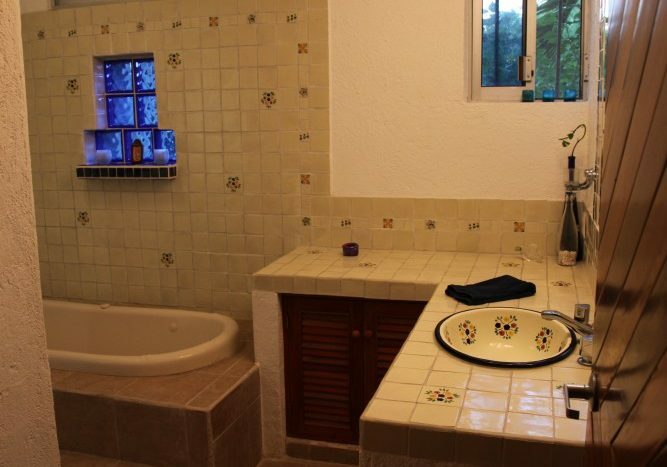 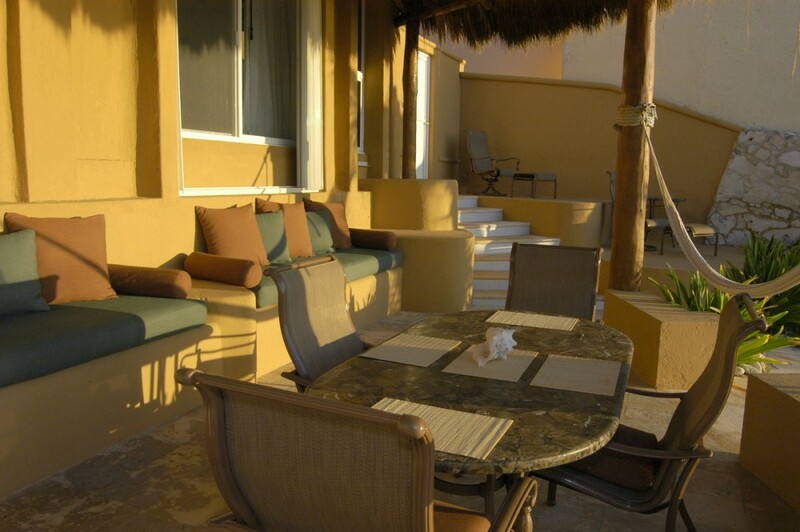 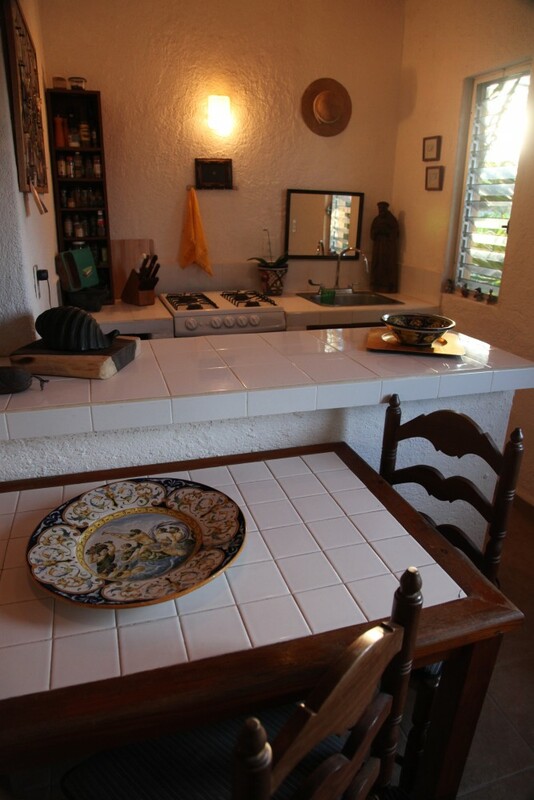 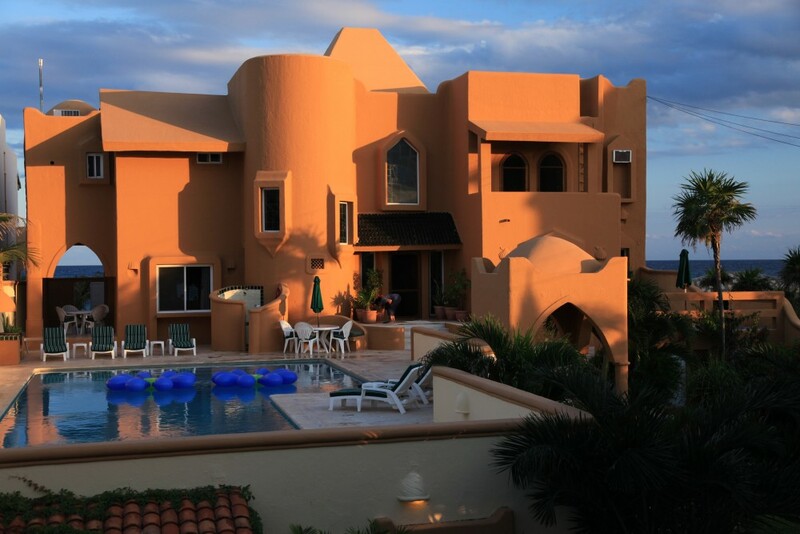 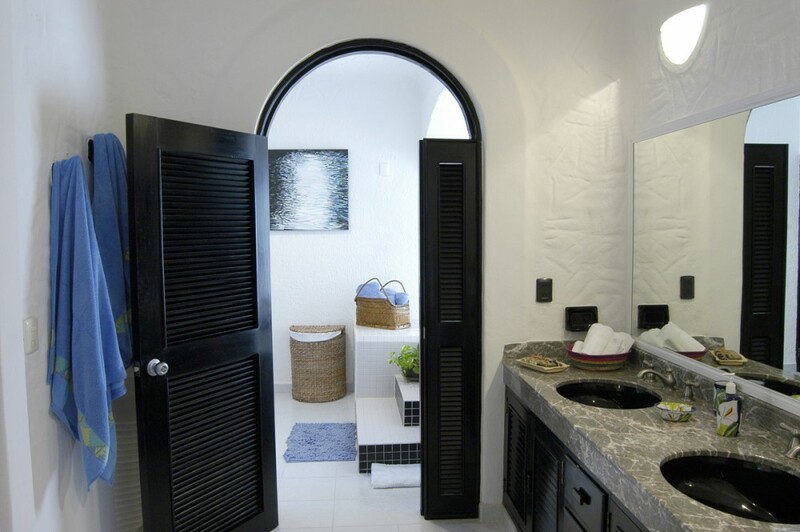 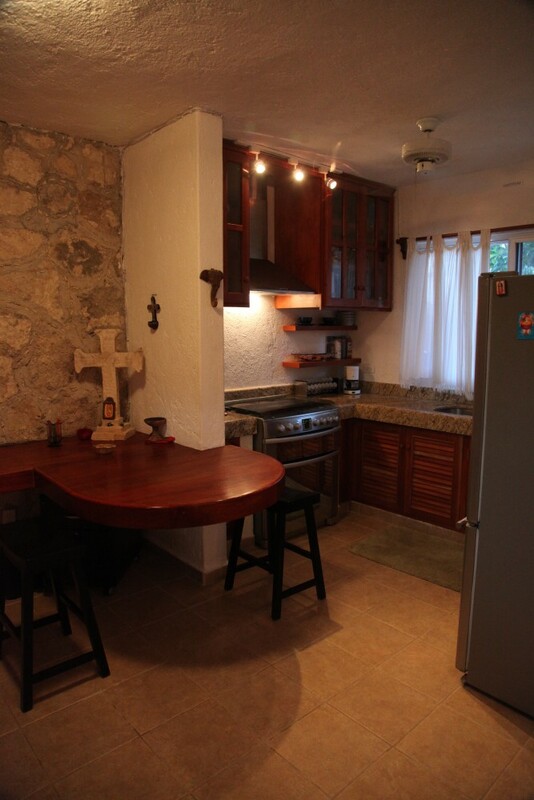 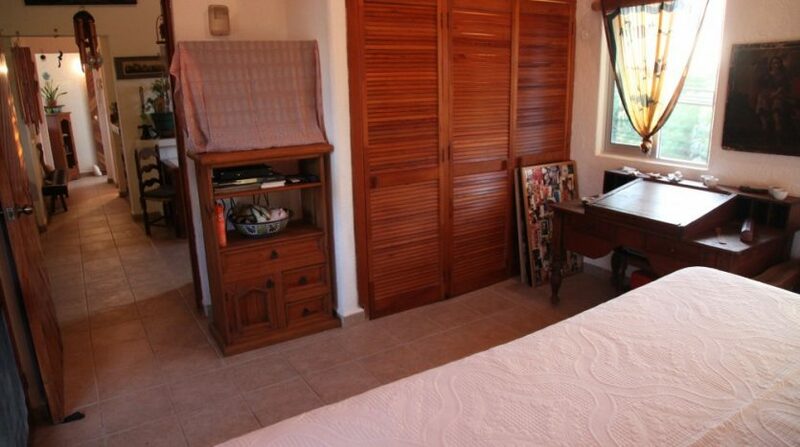 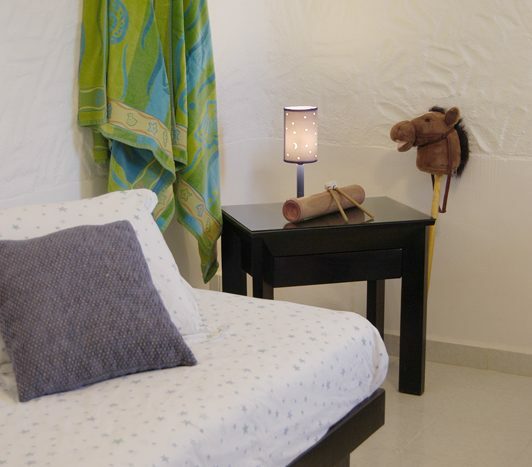 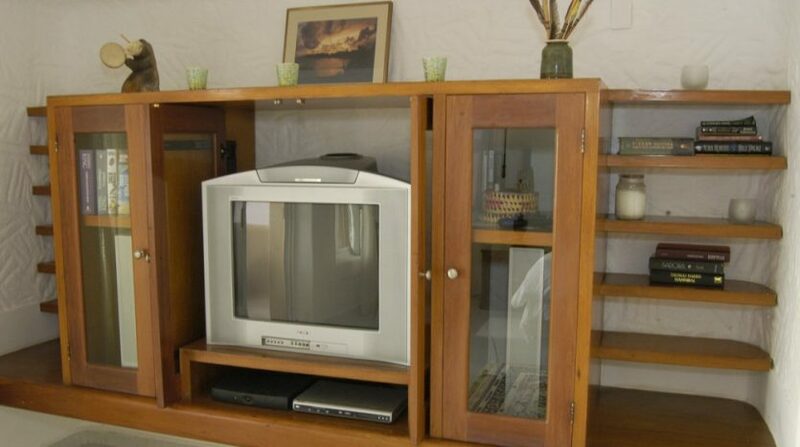 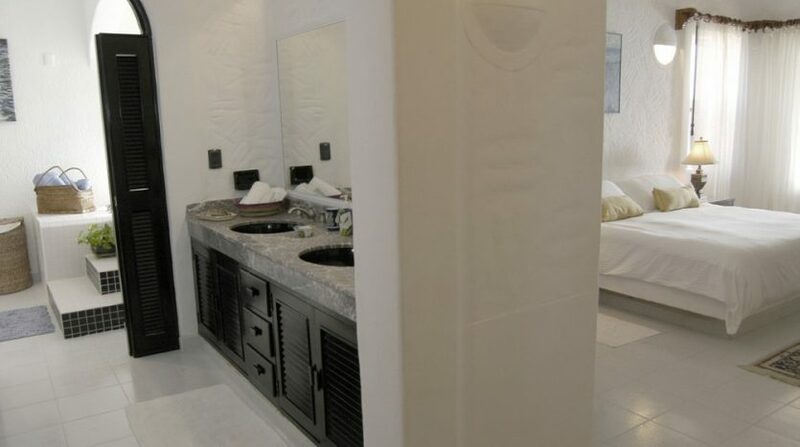 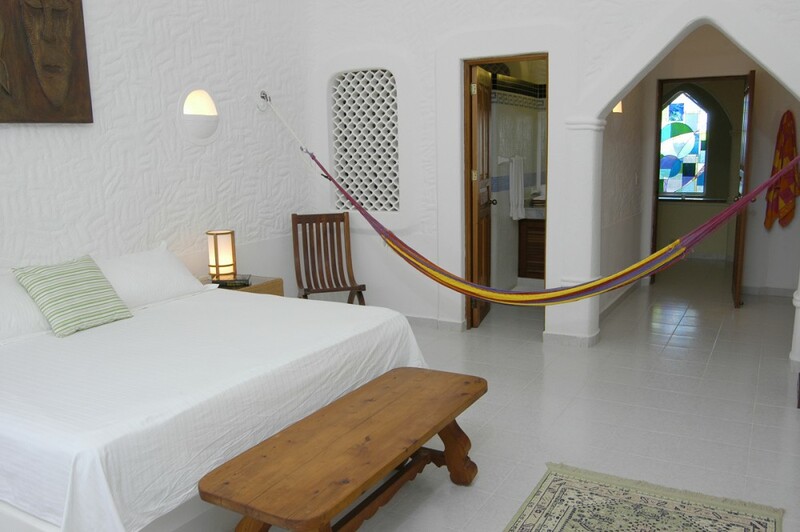 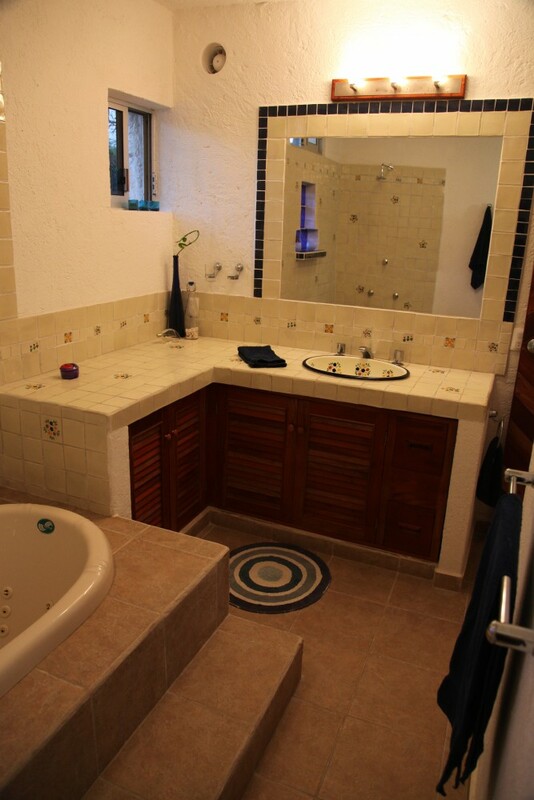 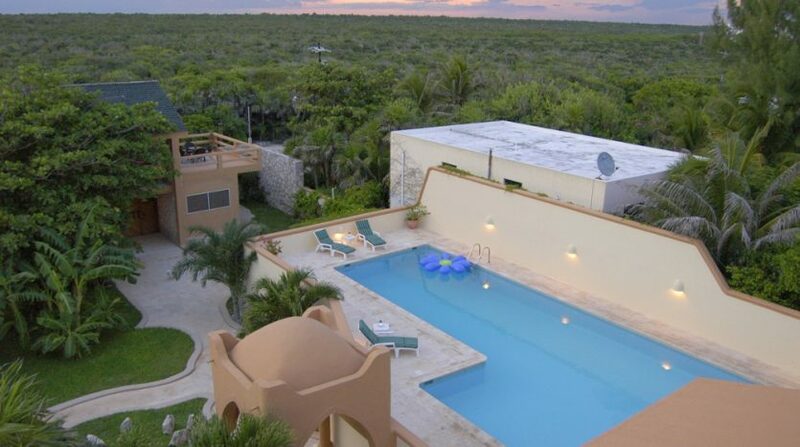 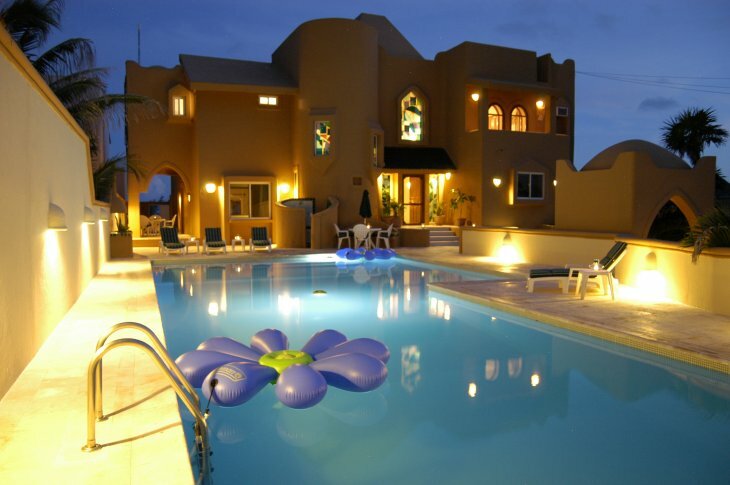 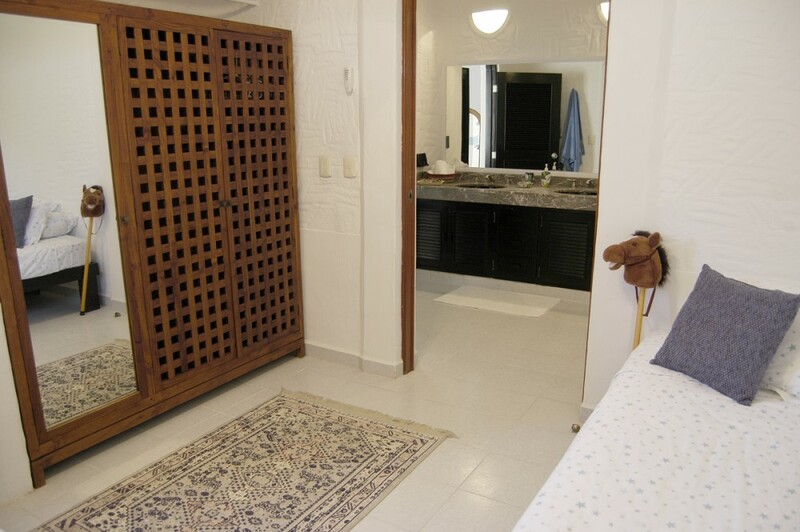 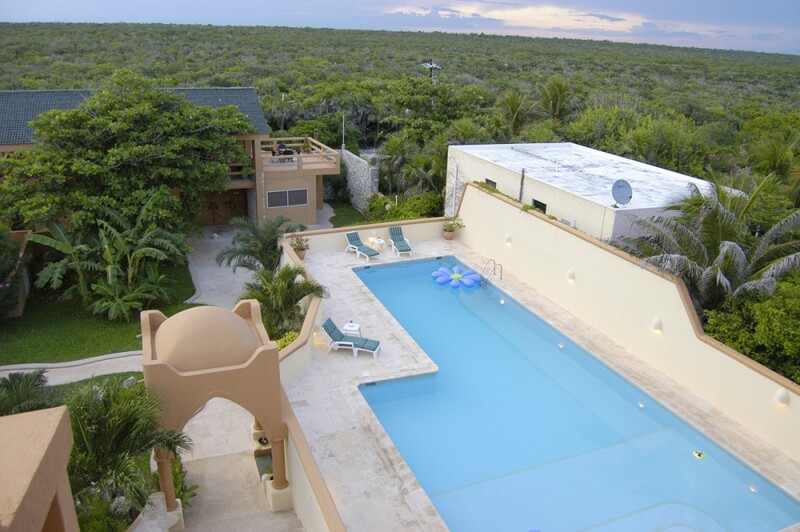 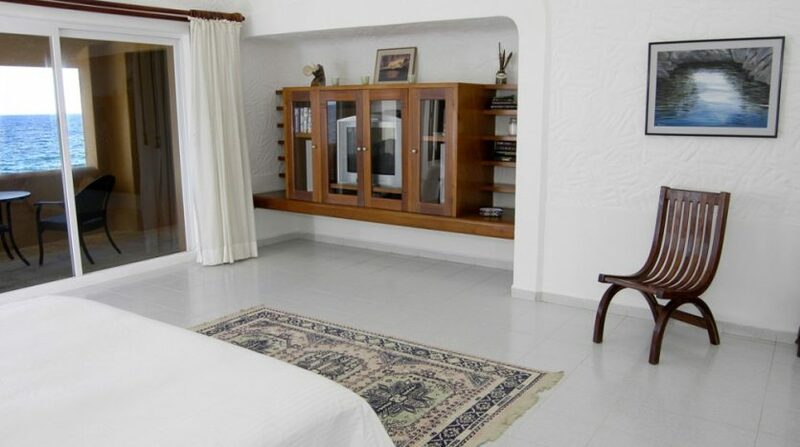 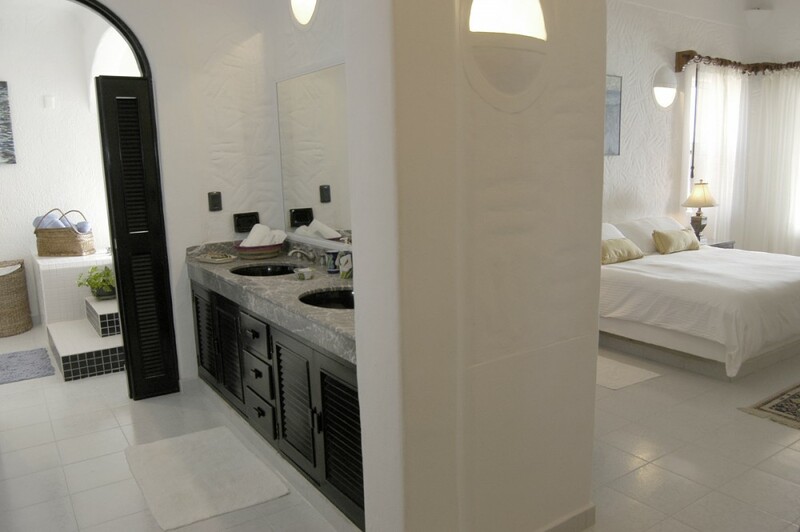 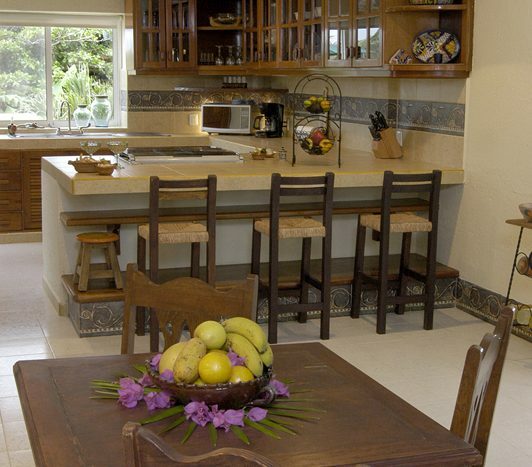 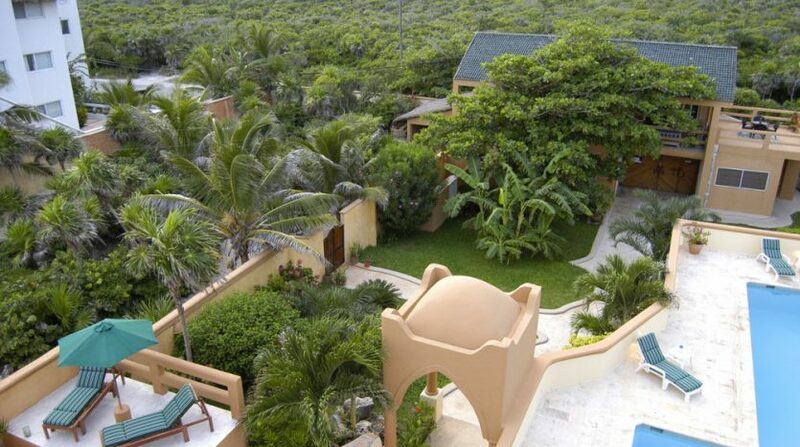 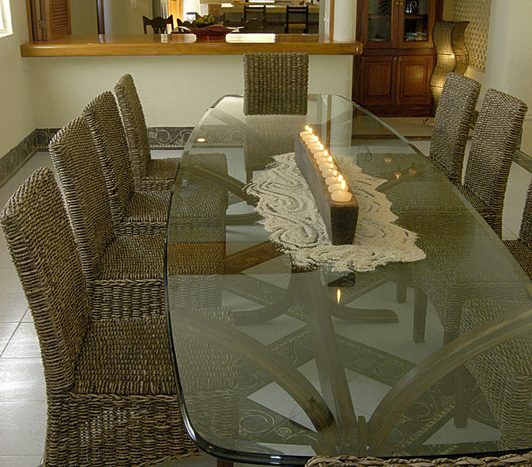 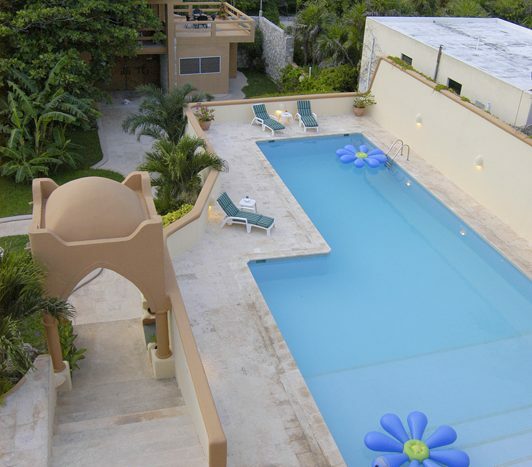 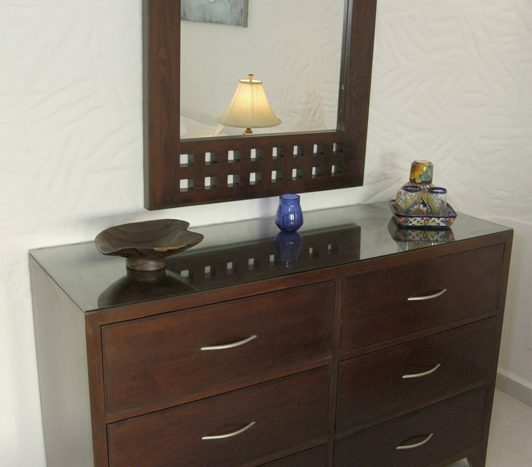 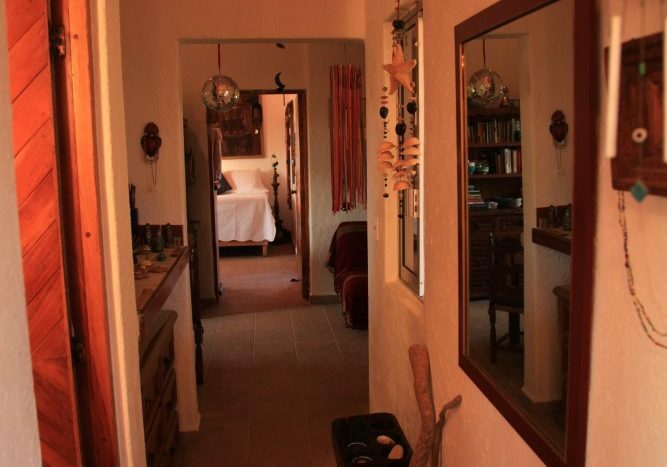 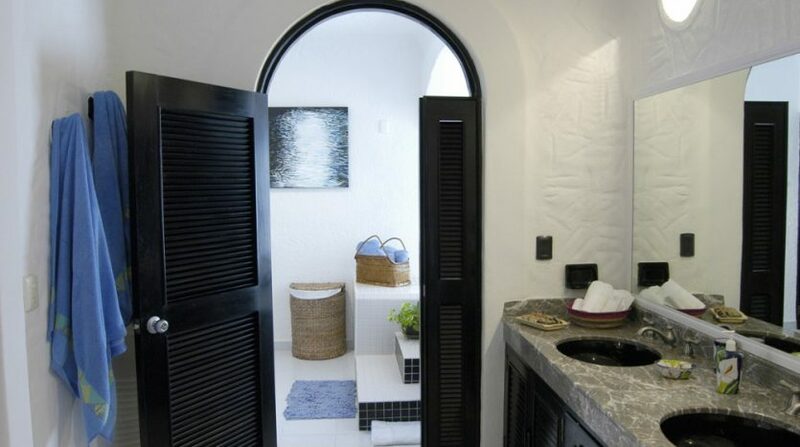 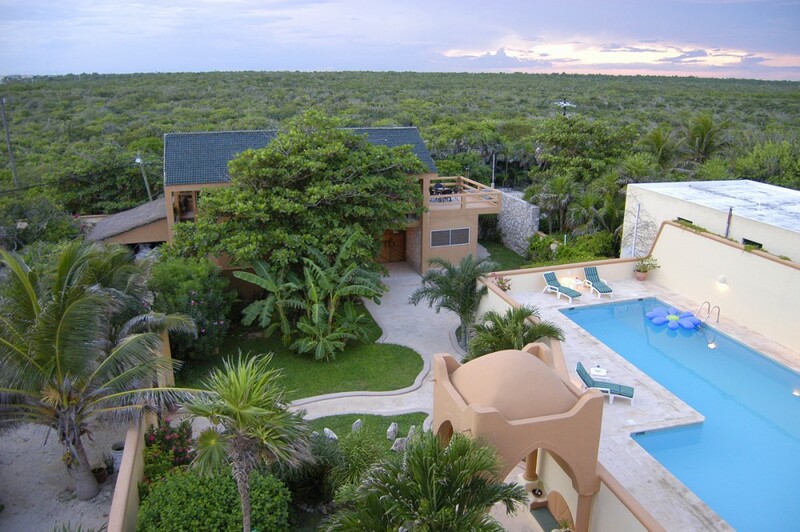 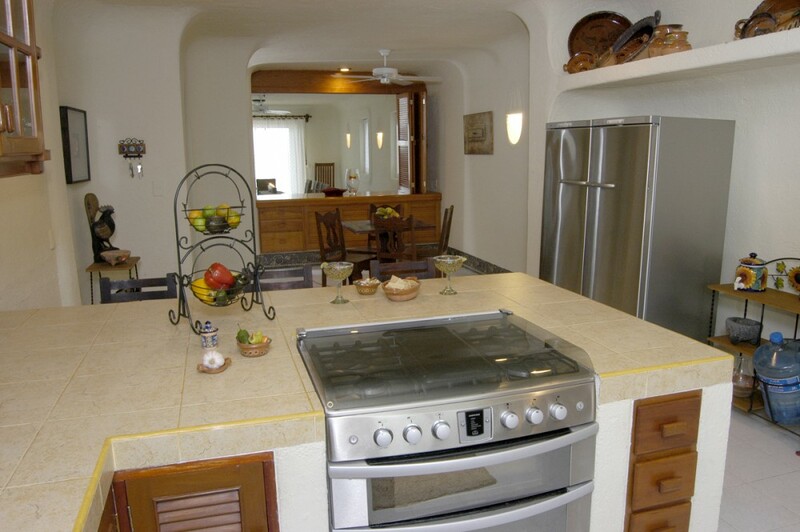 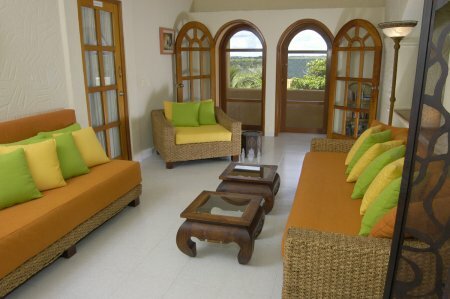 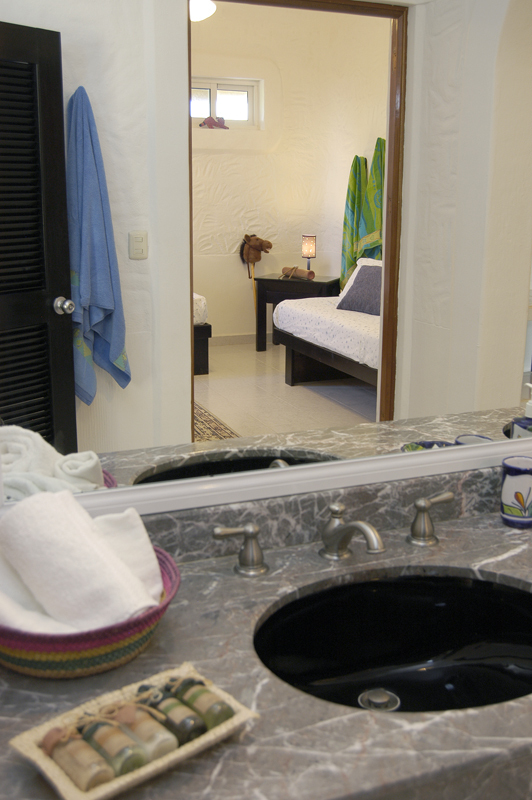 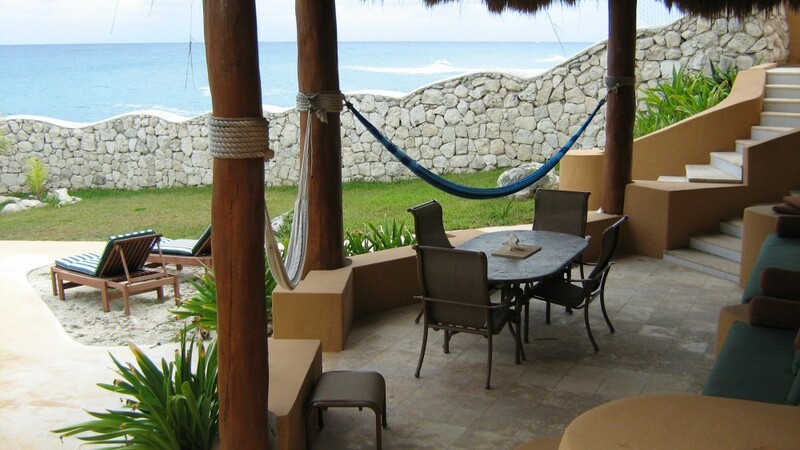 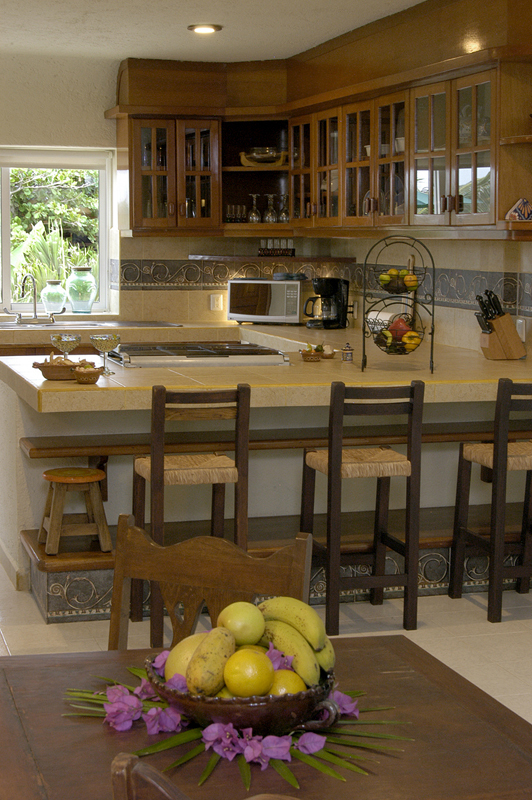 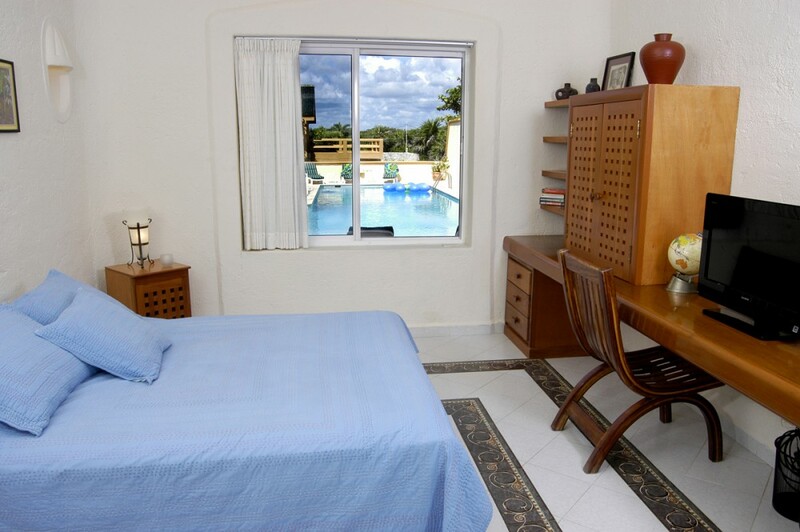 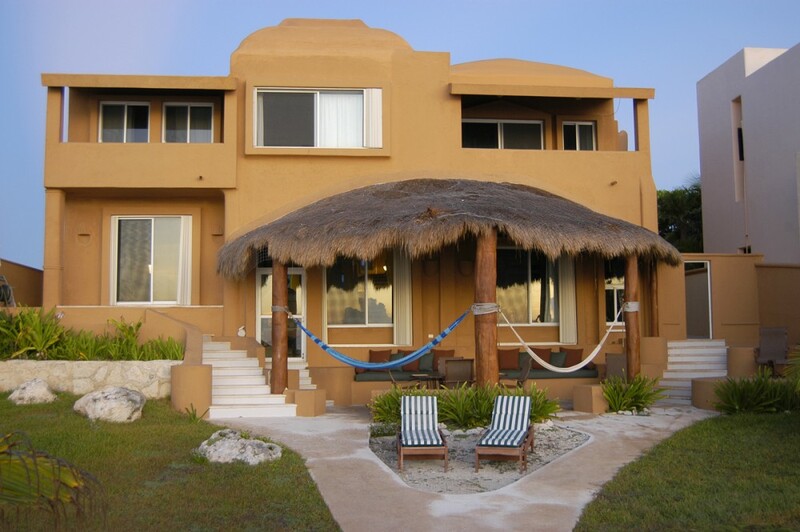 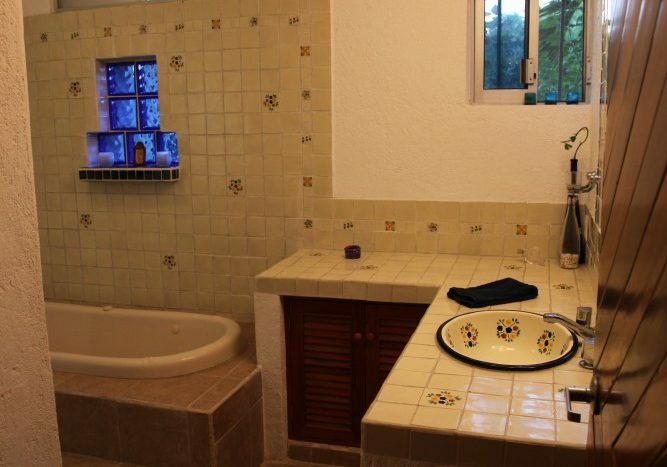 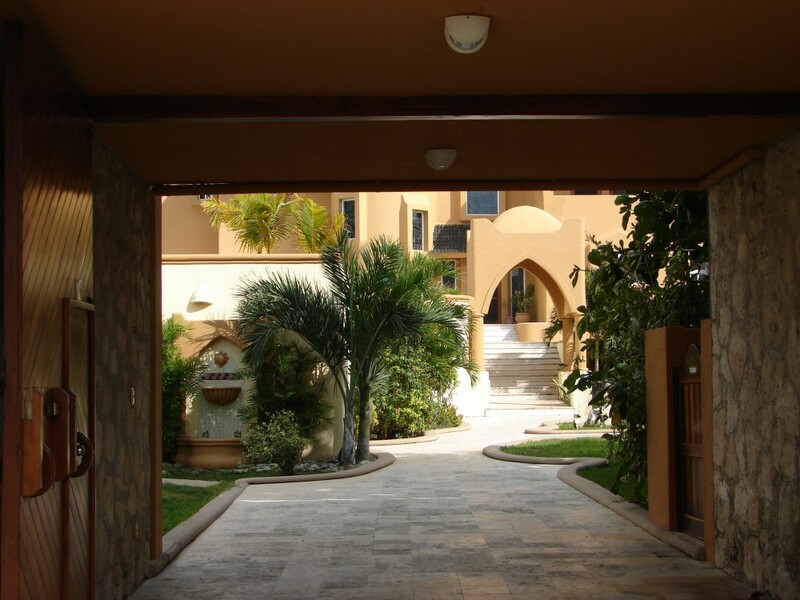 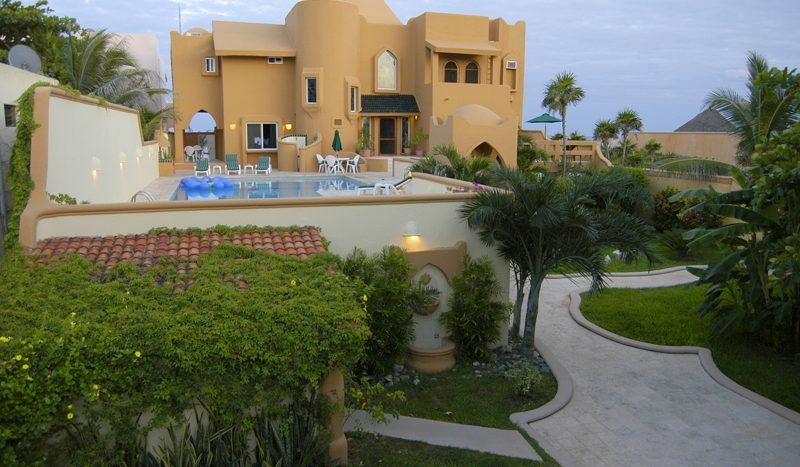 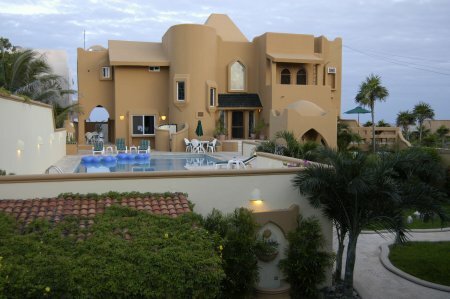 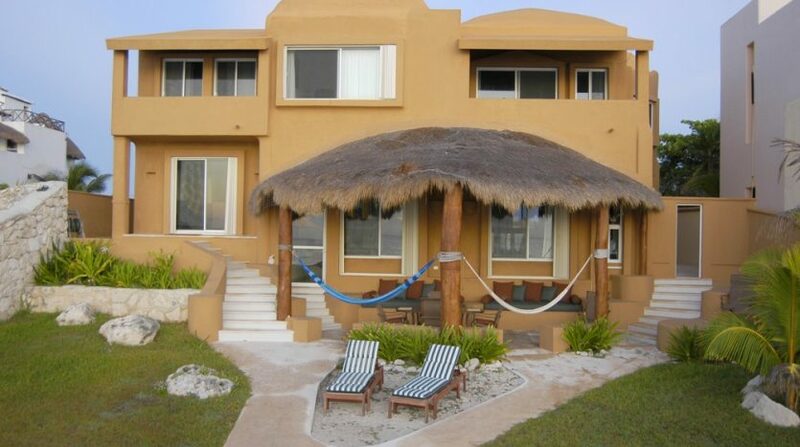 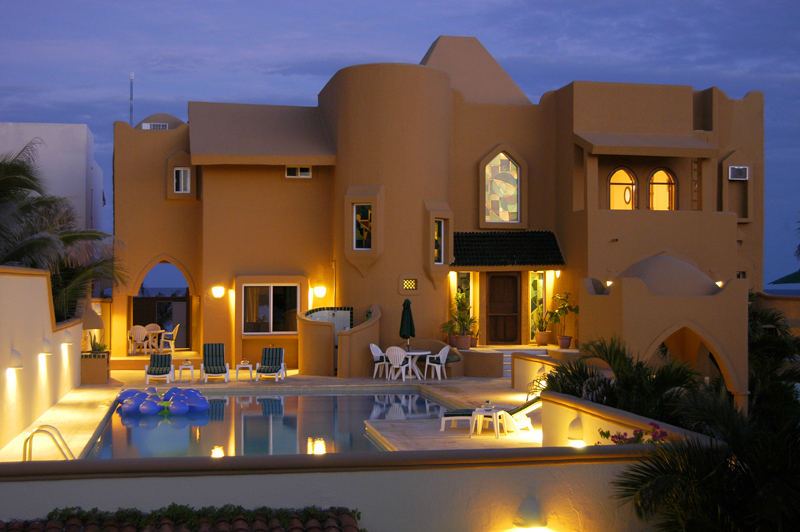 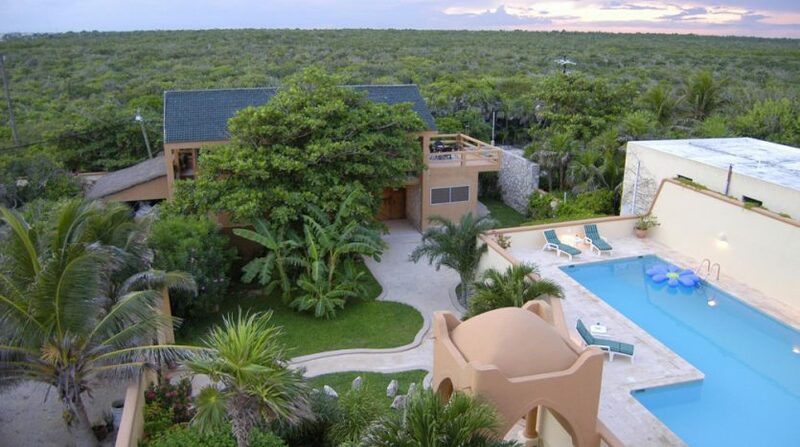 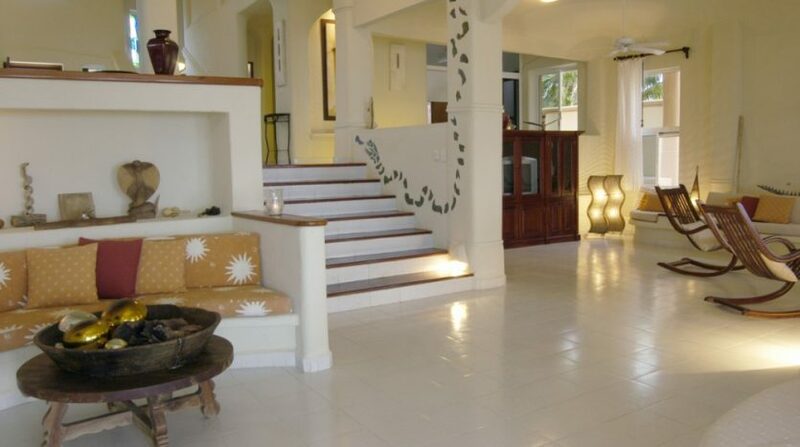 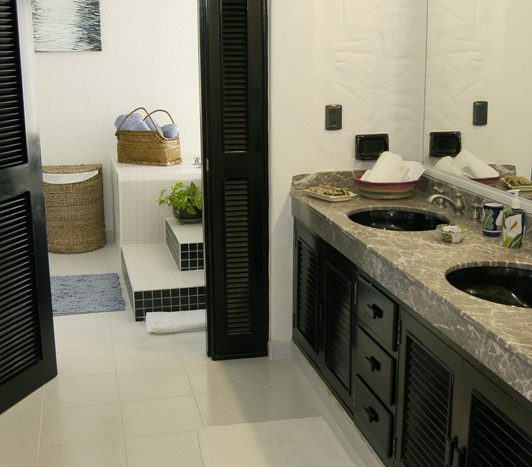 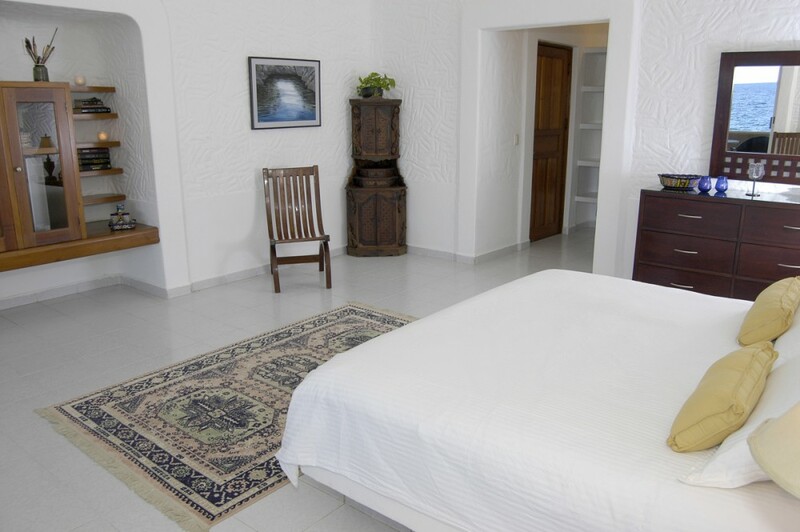 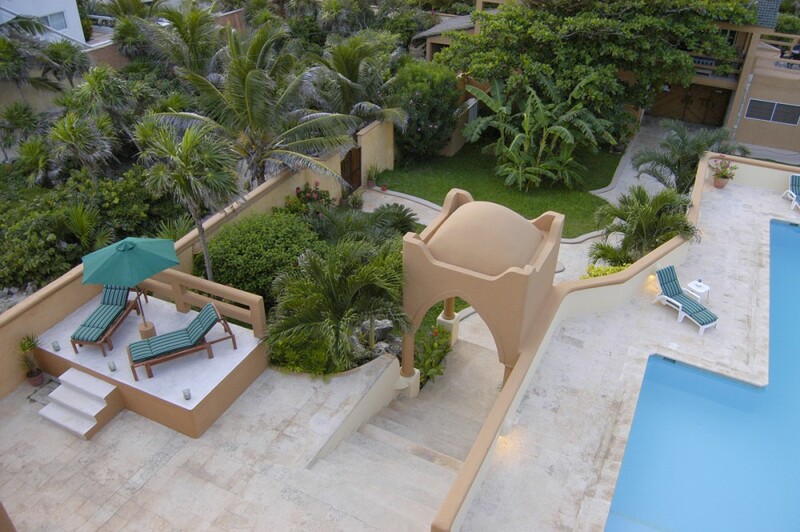 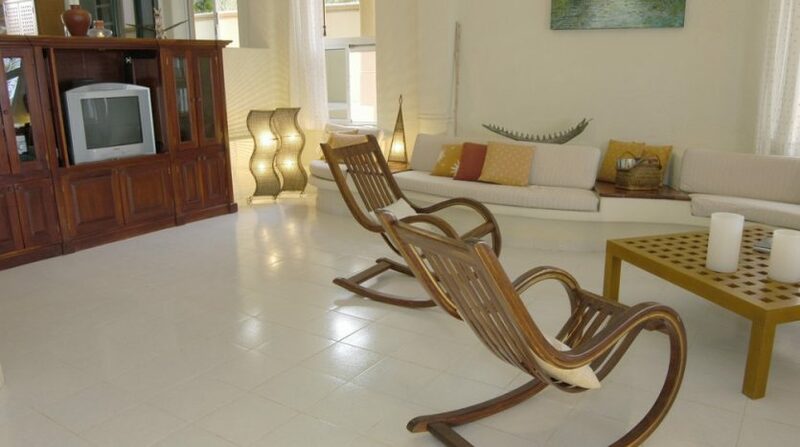 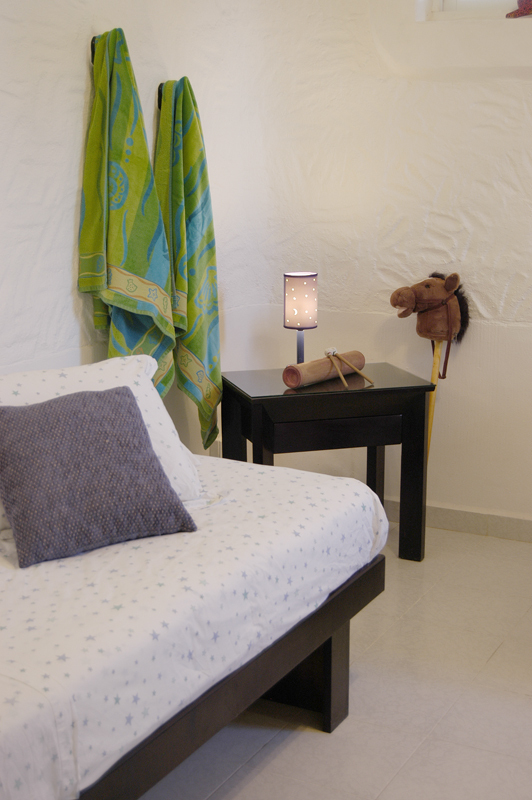 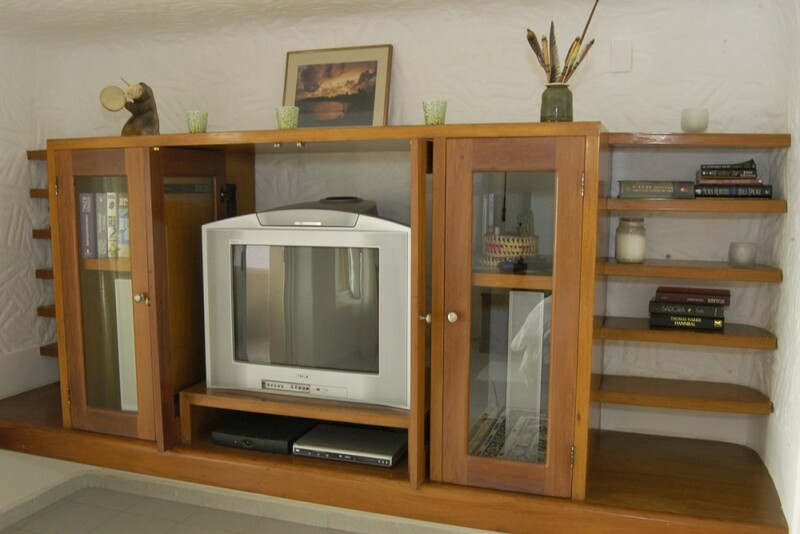 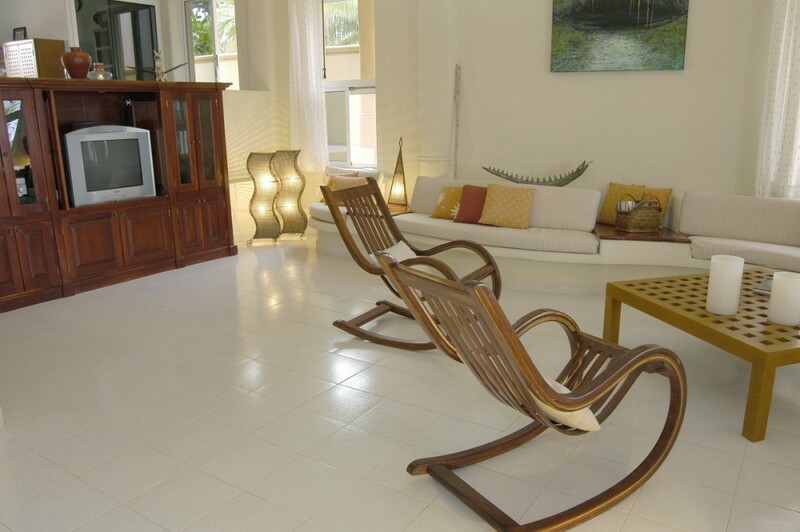 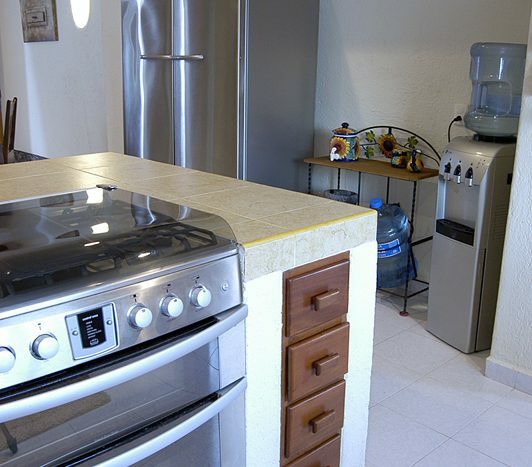 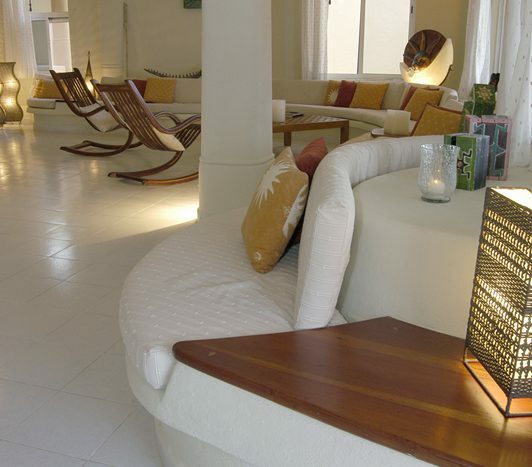 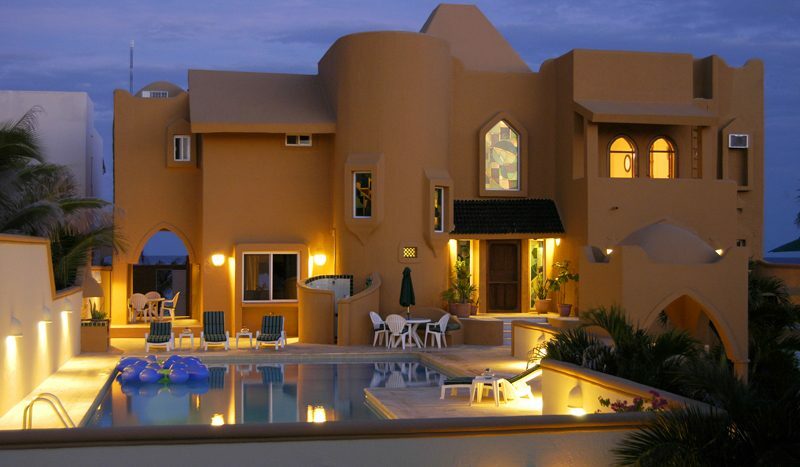 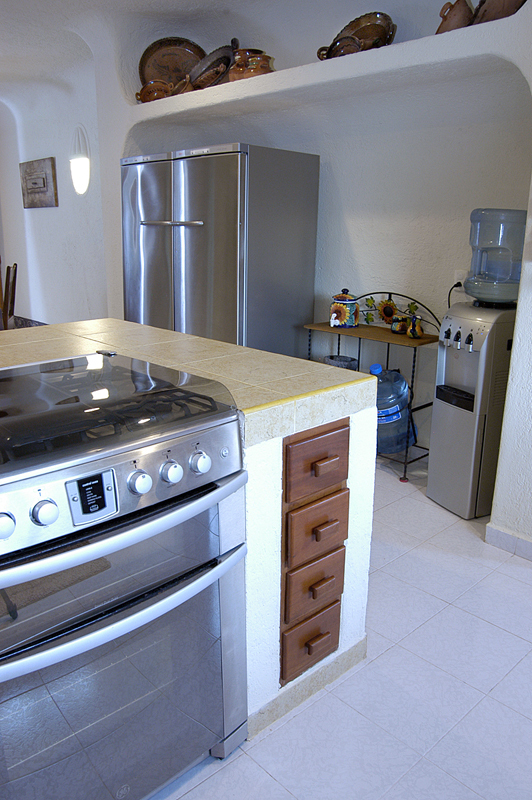 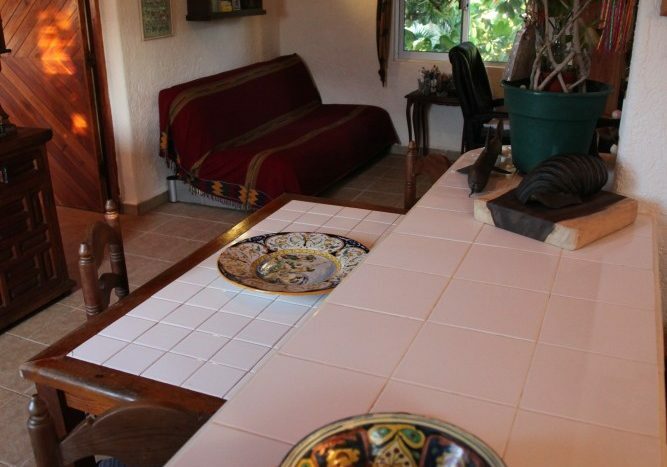 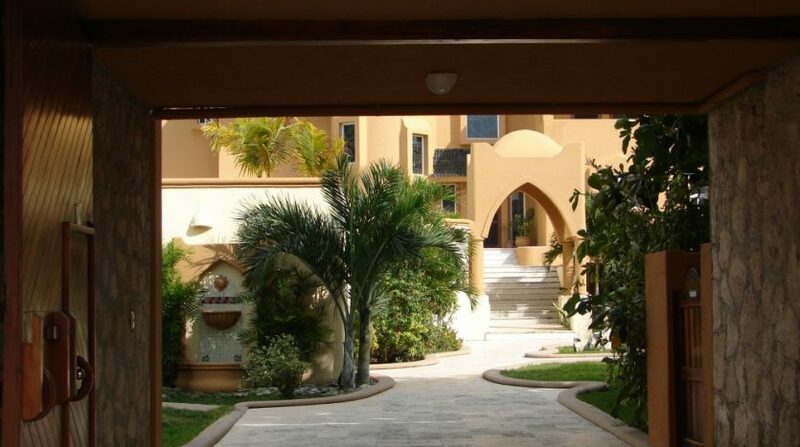 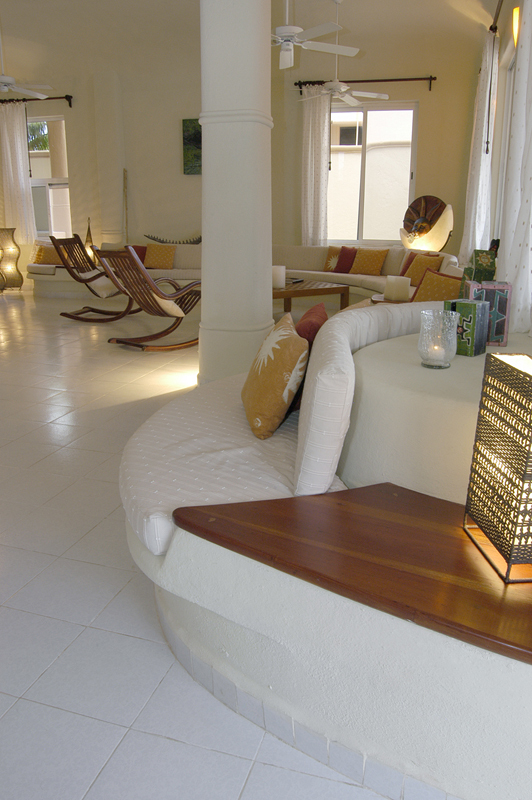 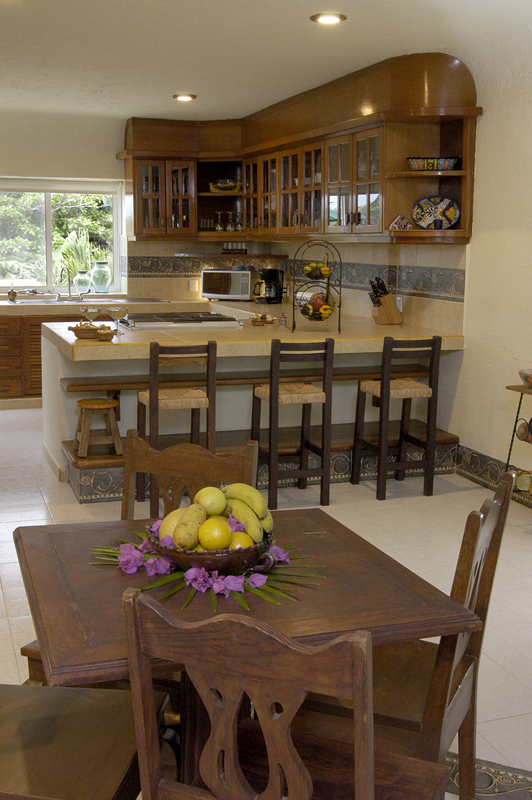 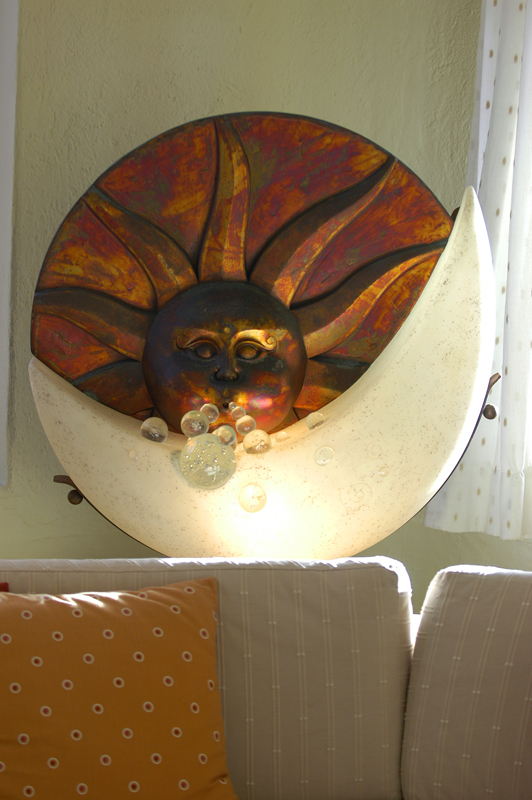 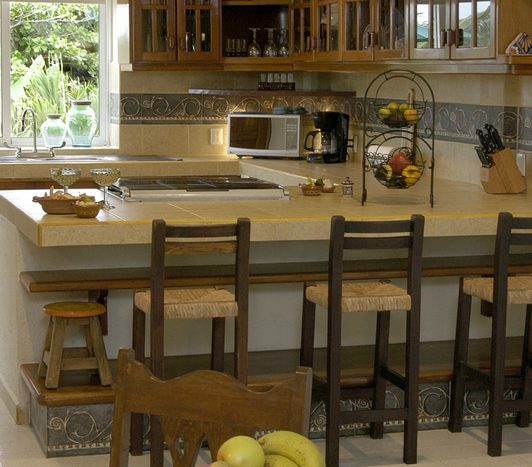 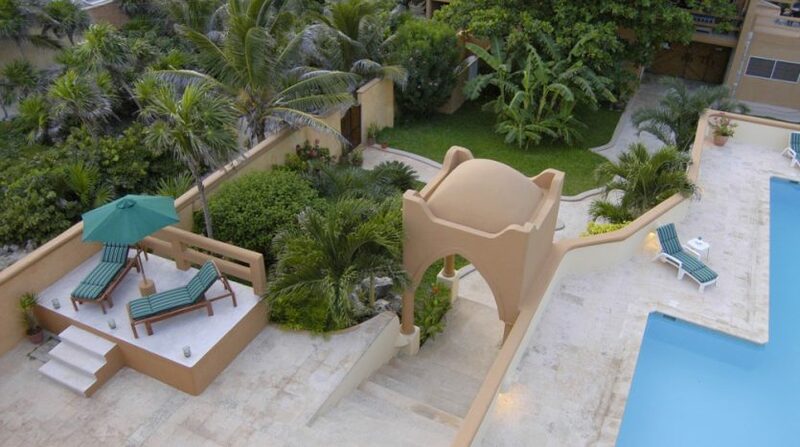 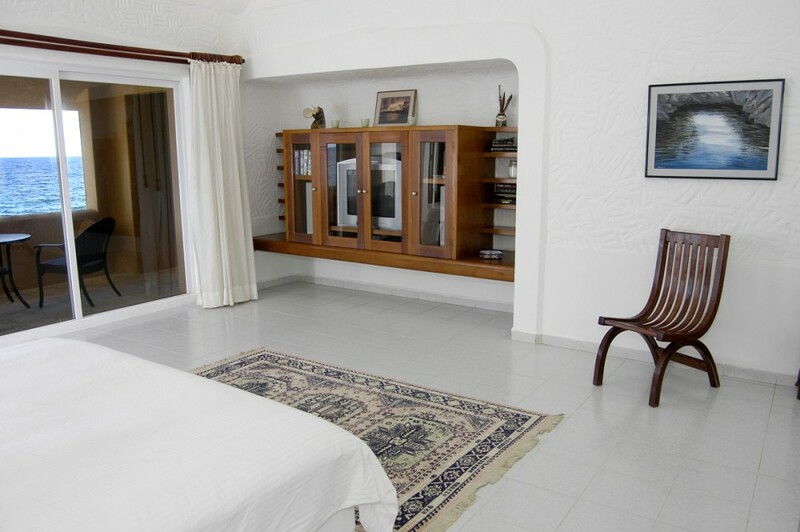 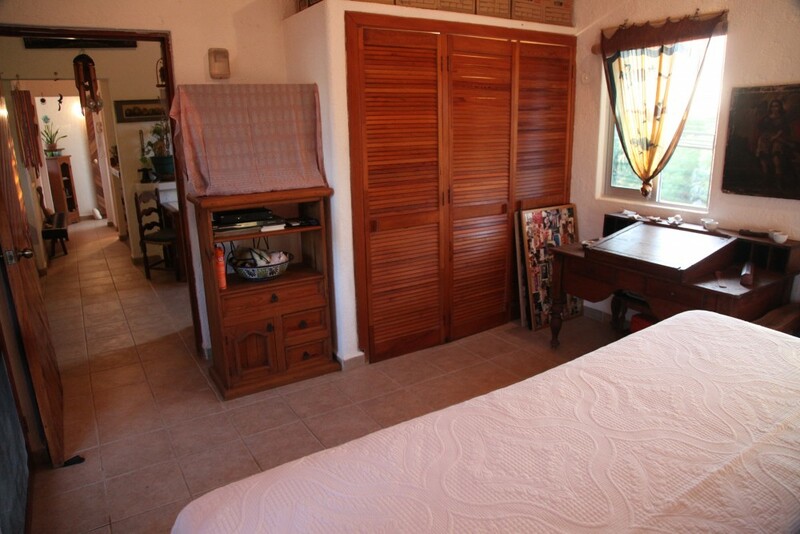 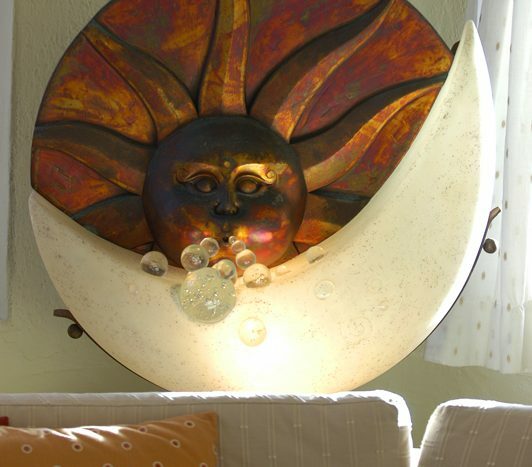 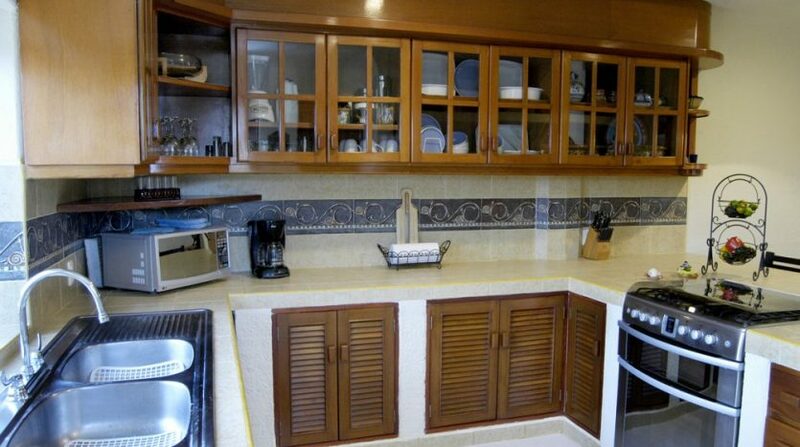 The Casa Magna Estate is a beautiful Akumal Mexico beachfront house for sale. 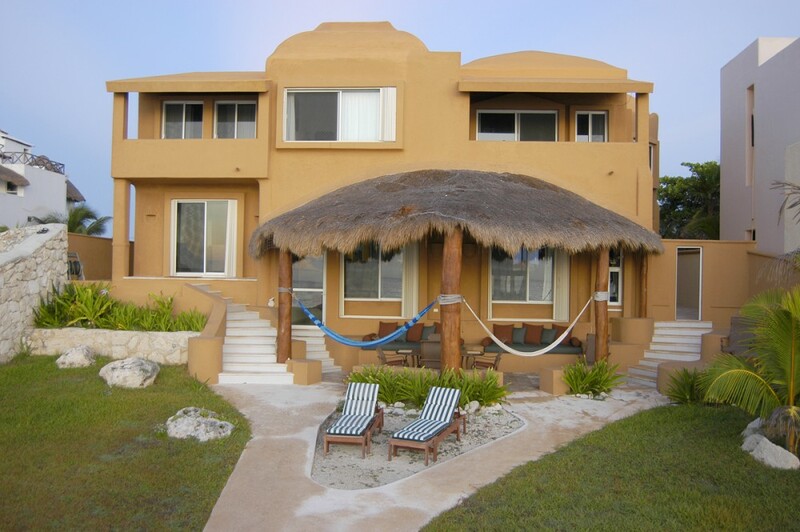 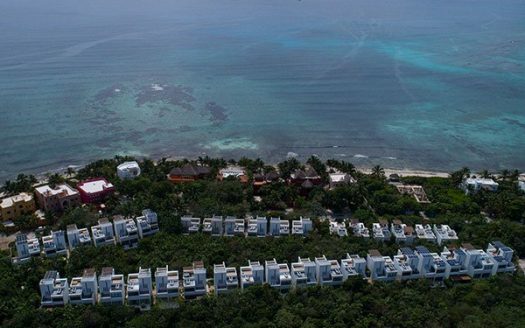 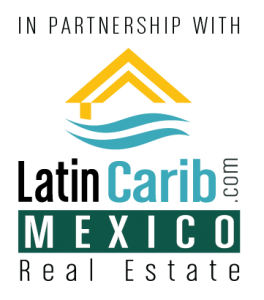 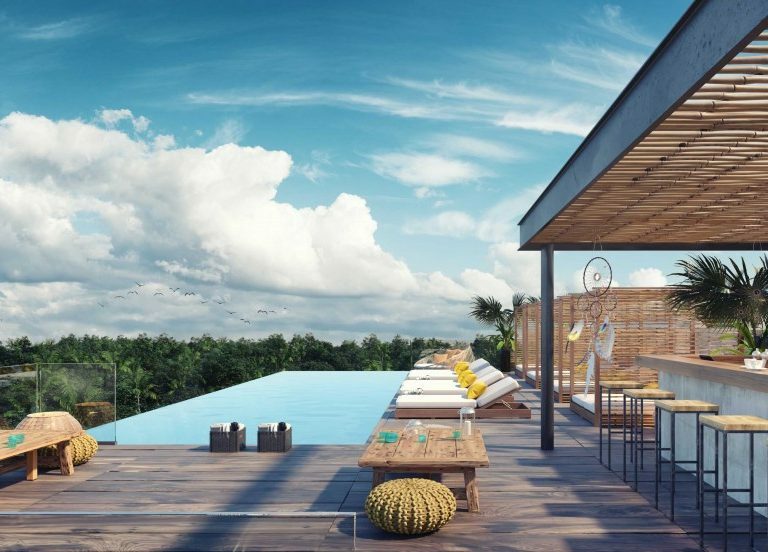 The beachfront house is a very private oceanfront property located in the heart of the Riviera Maya in the town of Akumal, just 60 miles south of Cancun, Mexico. 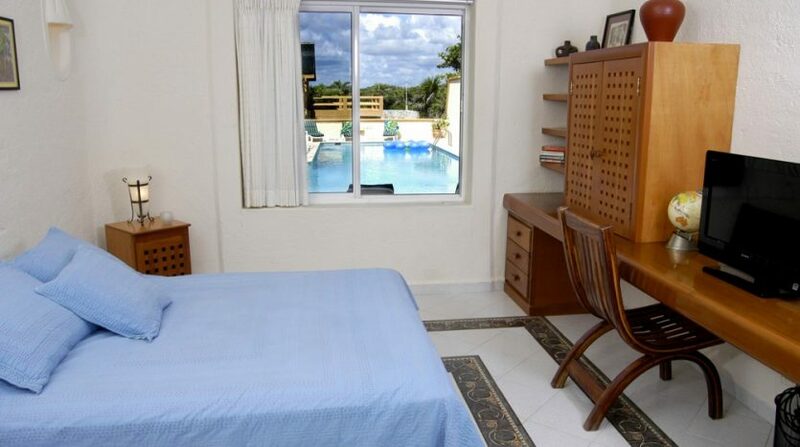 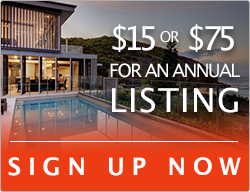 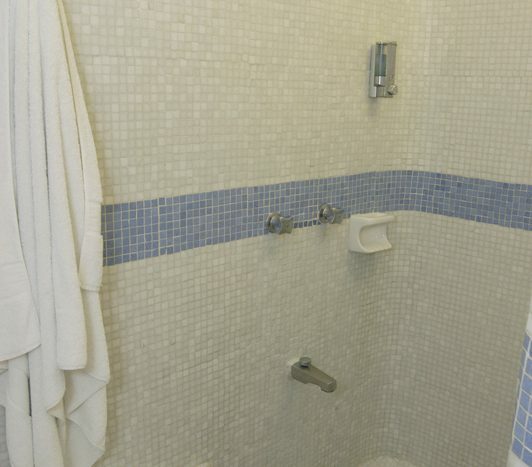 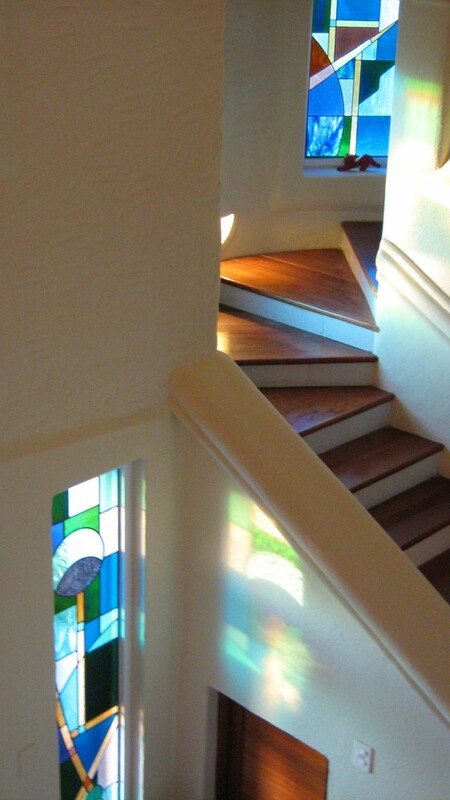 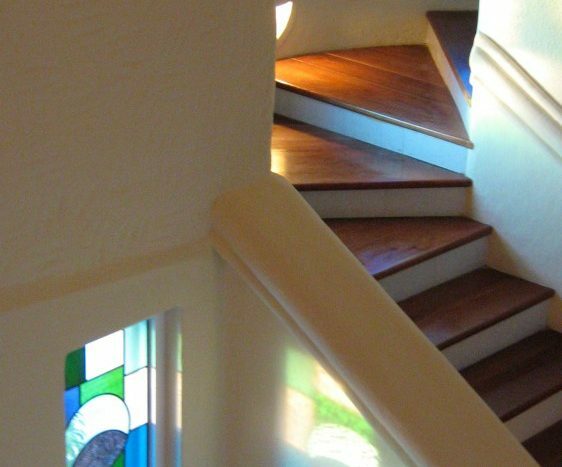 The entire property is enclosed for complete privacy. 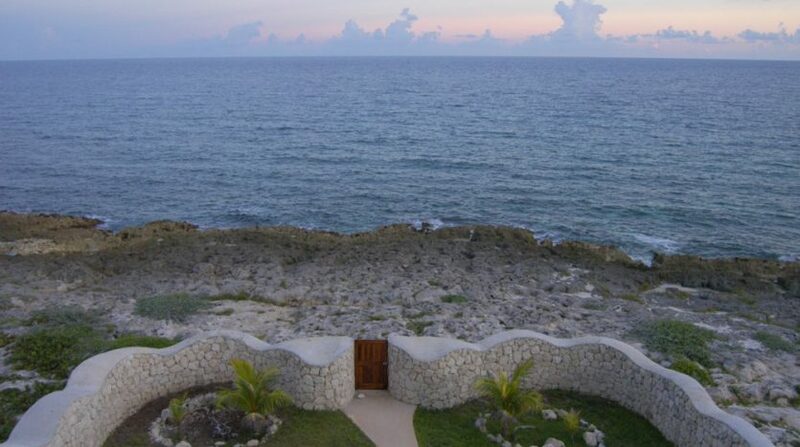 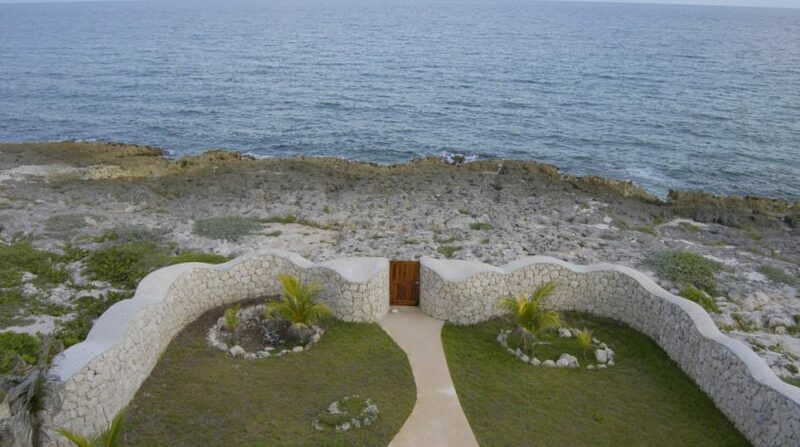 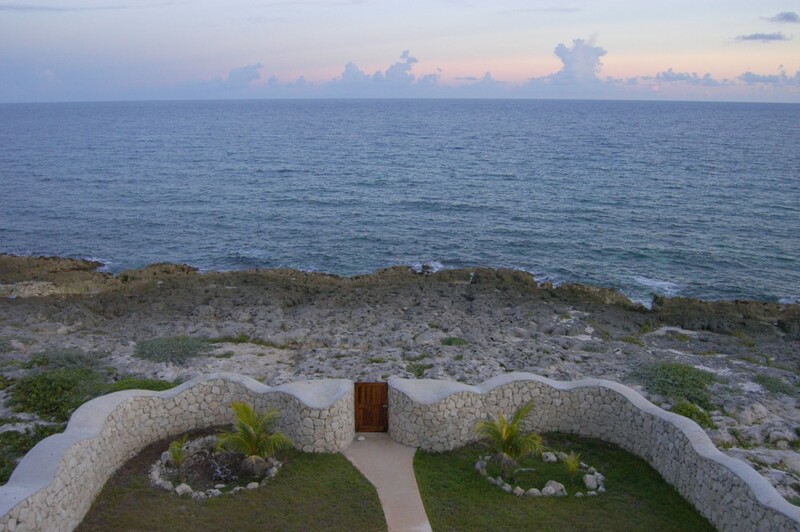 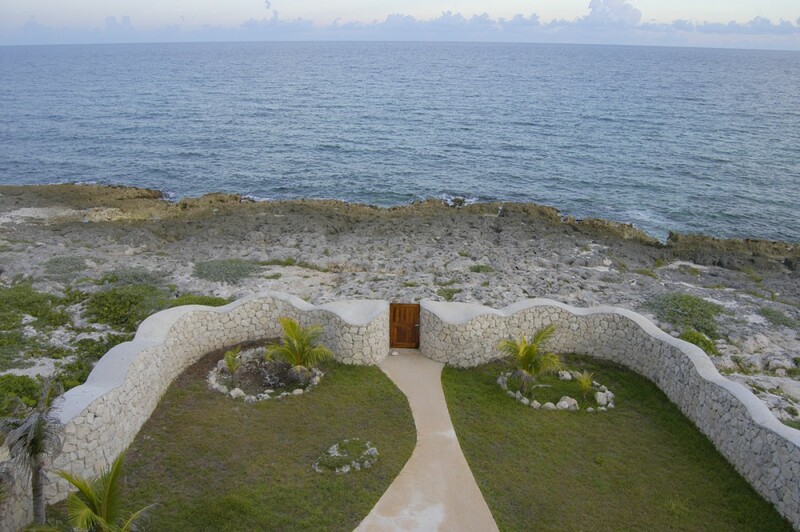 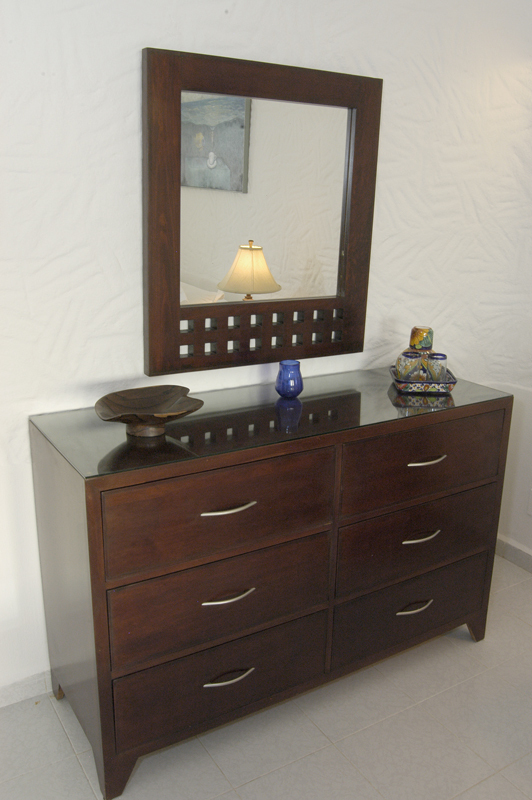 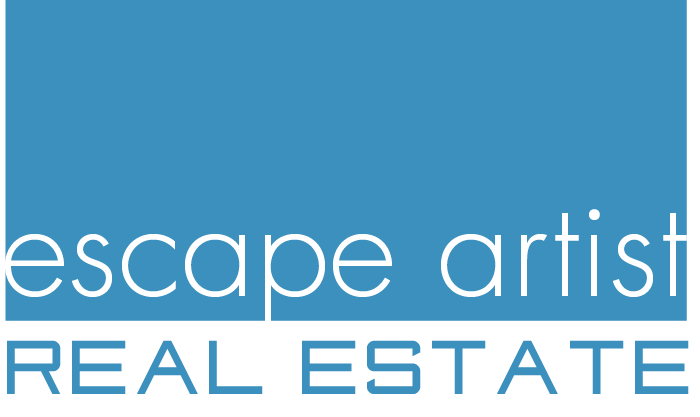 Situated on the rocky coastline further insures privacy and security. 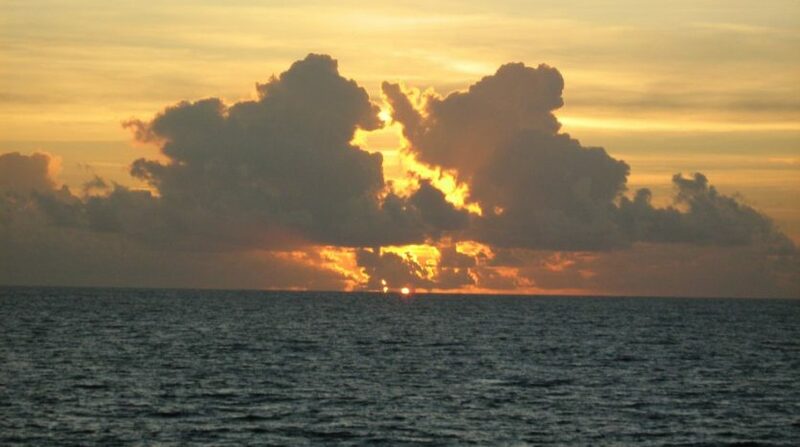 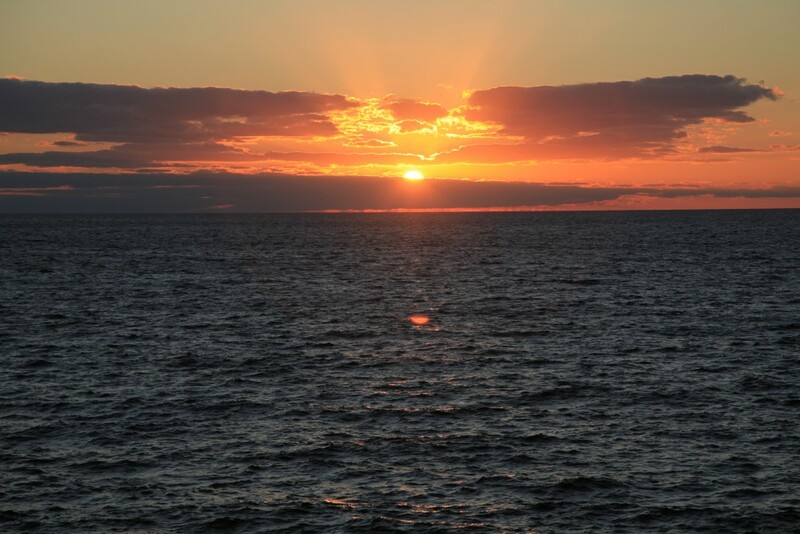 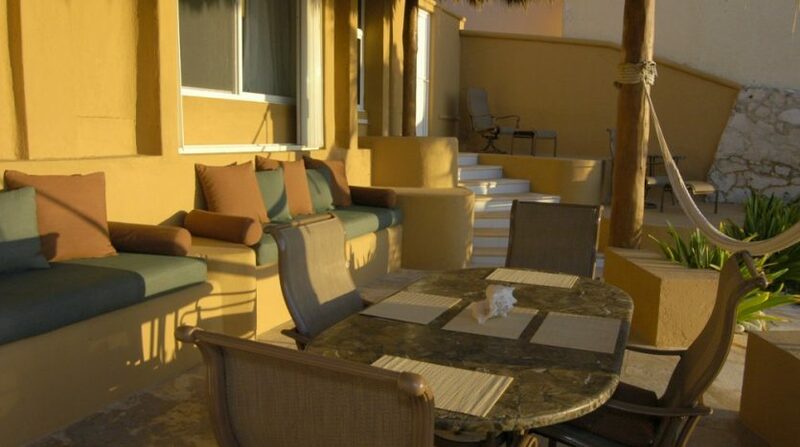 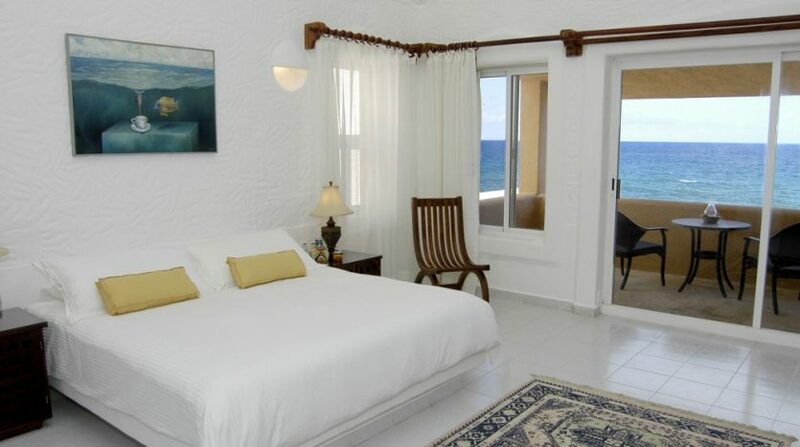 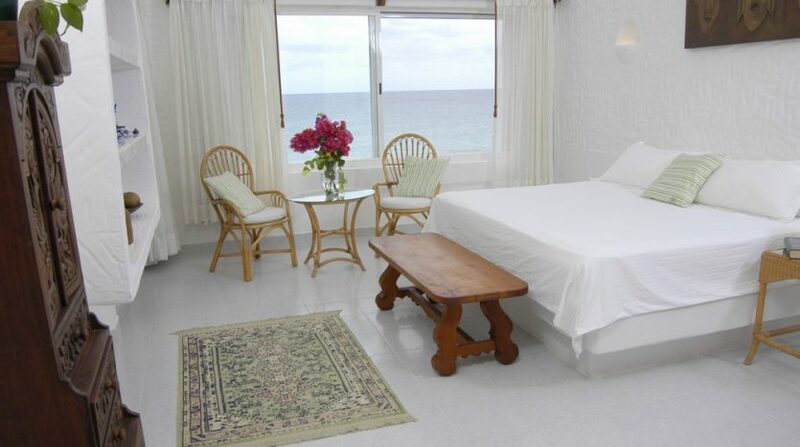 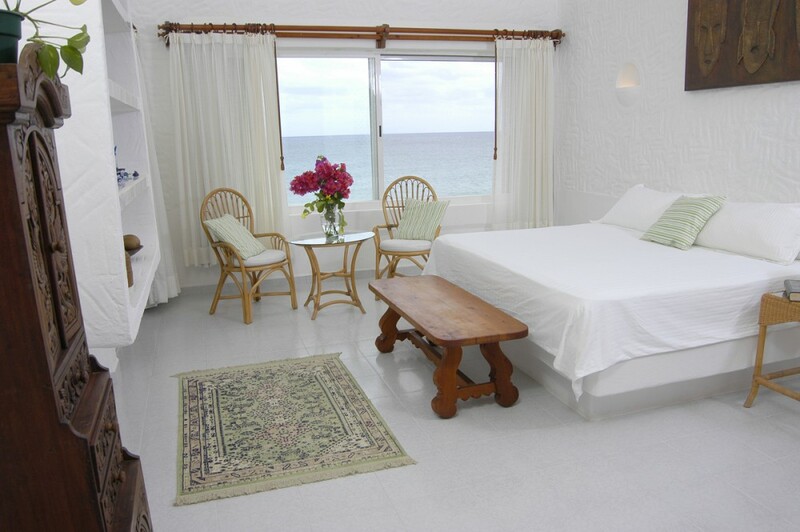 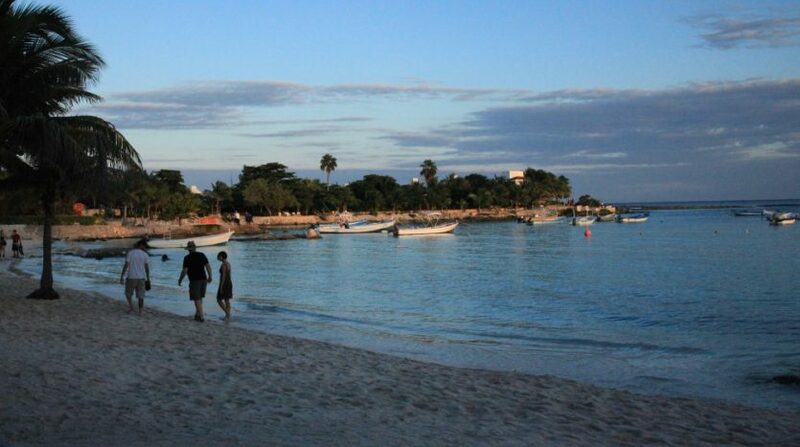 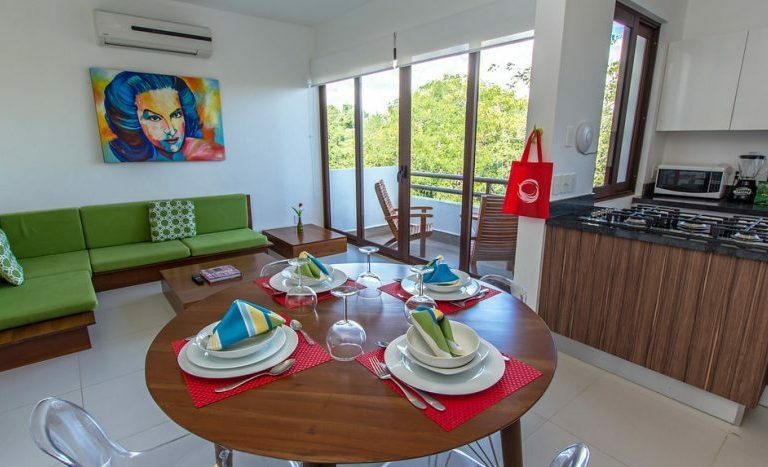 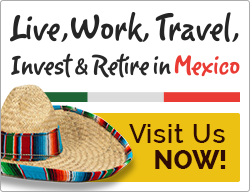 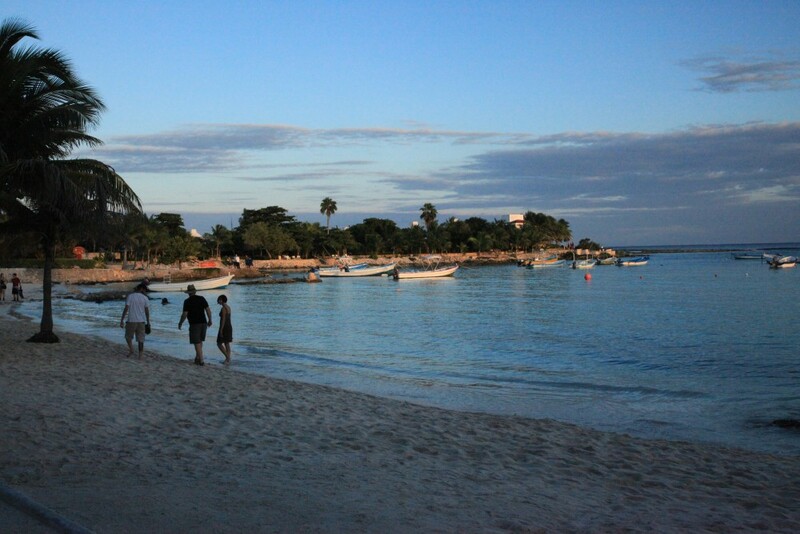 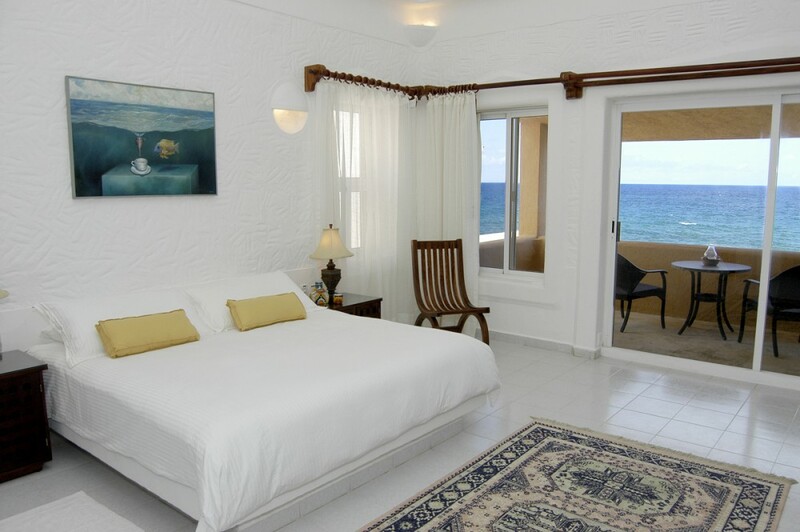 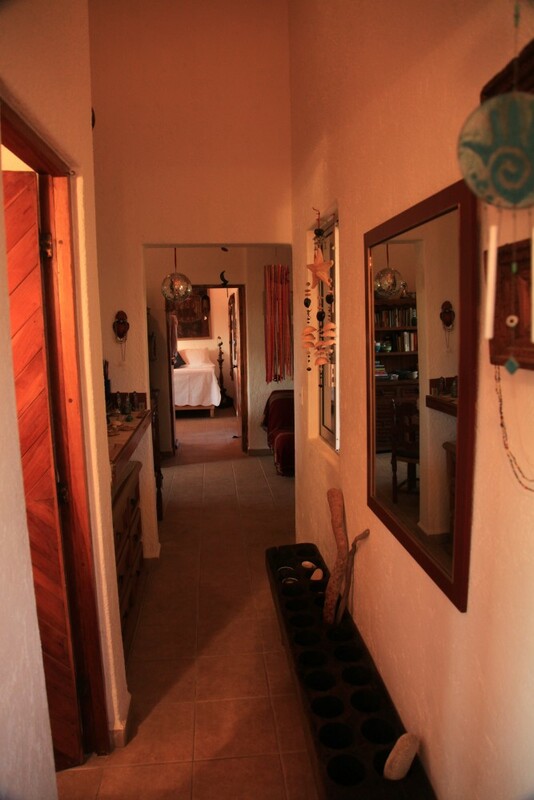 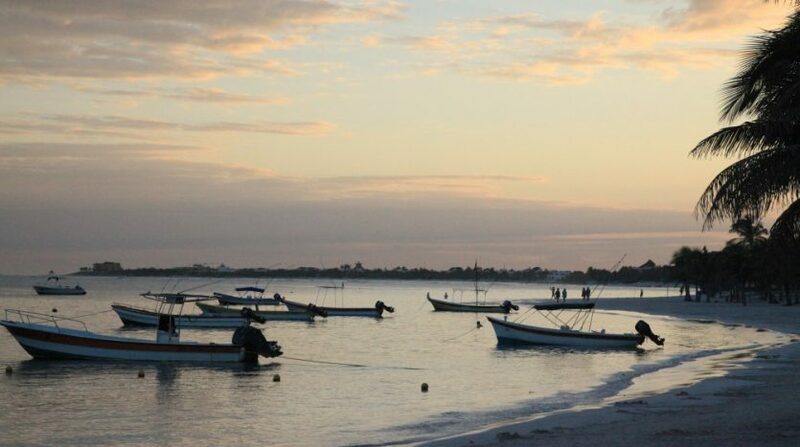 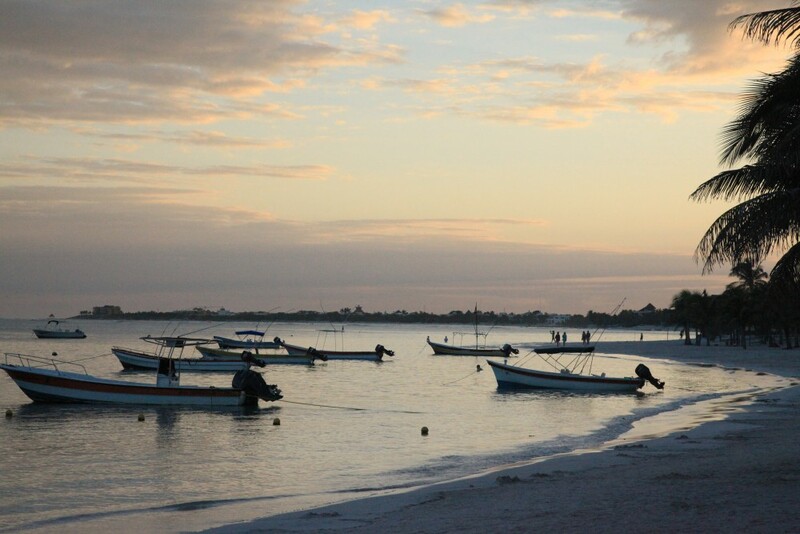 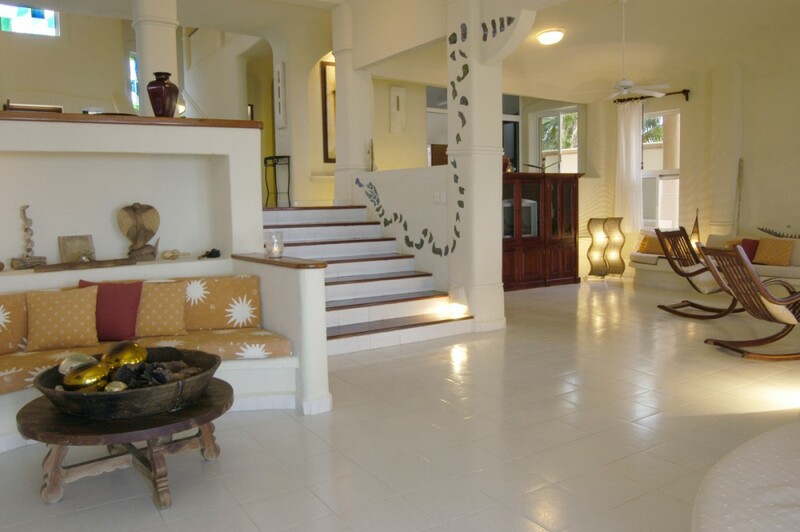 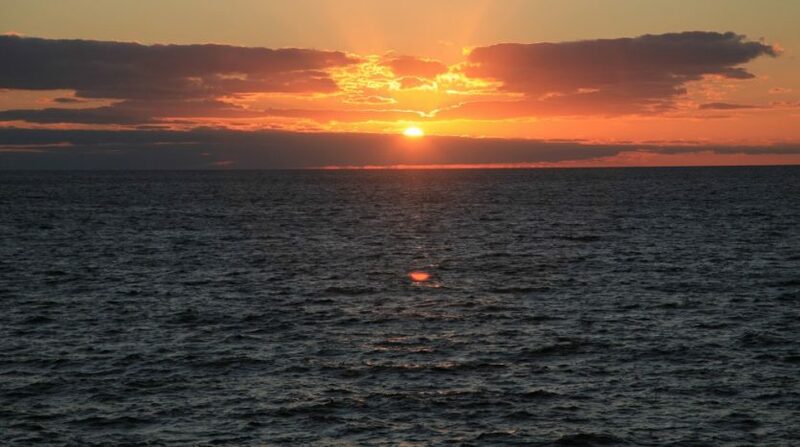 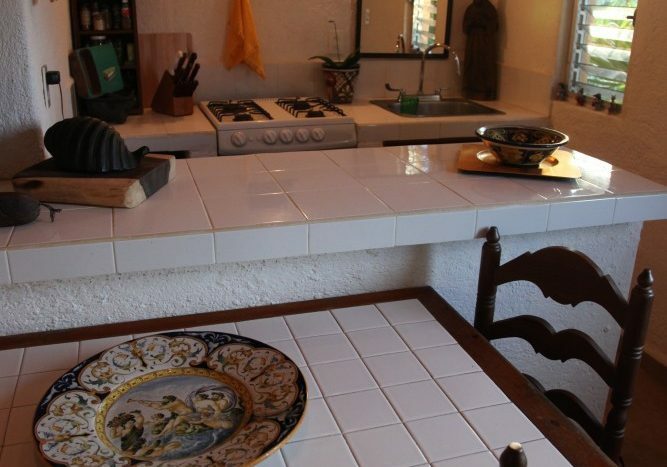 It is a 5 minute walk to restaurants, beaches, dive shops and more. 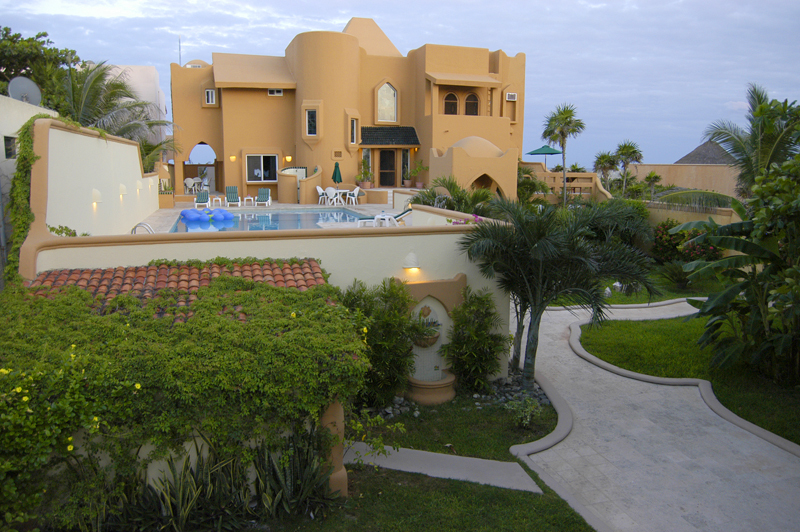 There are two oceanfront lots. 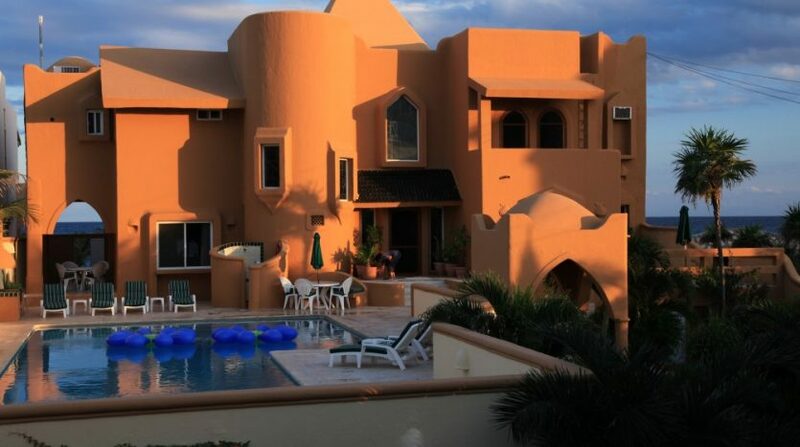 One lot is a garden lot with a path that walks you through a tropical assortment of beautiful plants, palms, banana trees, cocoa trees and more. 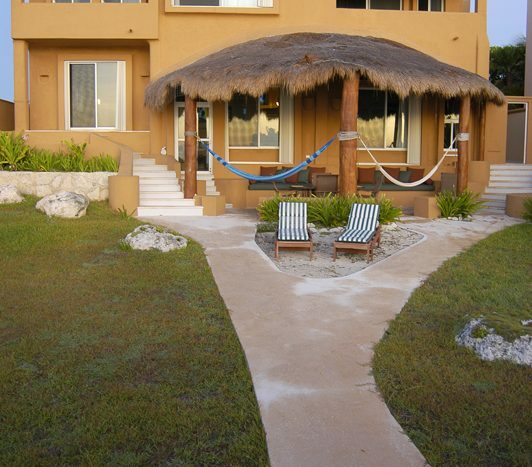 The garden lot has its own entrance door from the road and a small open air palapa covered dog house with three stalls. 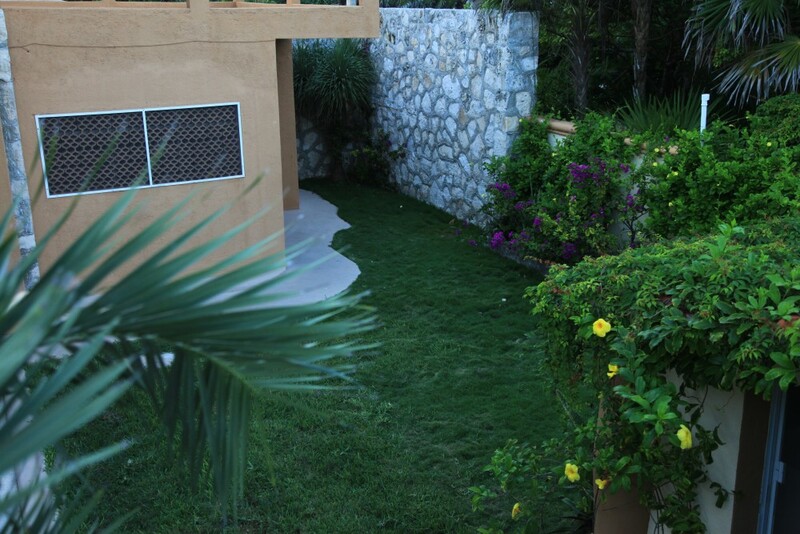 You can build on this lot and it can be sold independently. 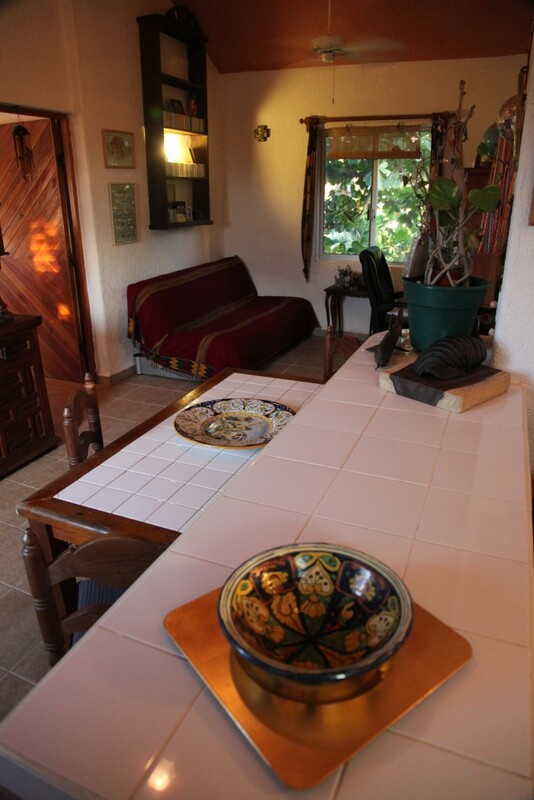 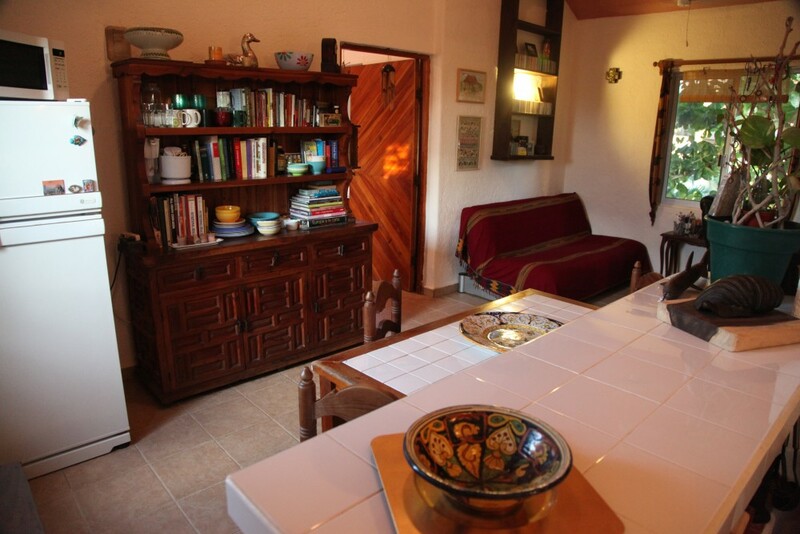 The other lot which adjoins the garden includes the house and the casitas. 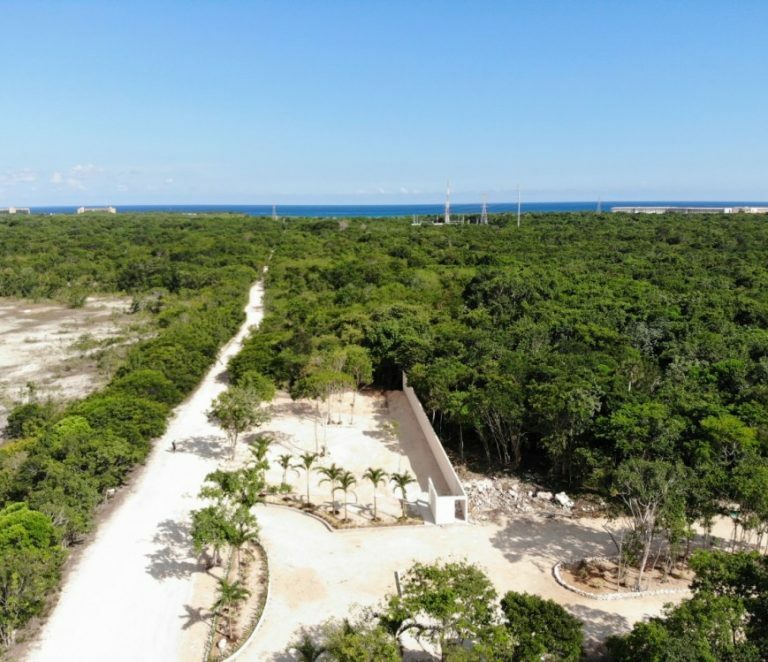 Once you walk through the gate, you will be enchanted by the tropical garden filled with a variety of plantings indigenous to the area. 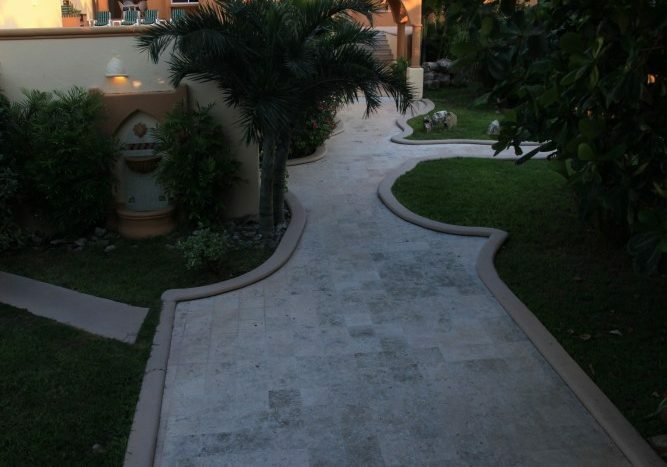 The beautifully tiled walkway leads you through the garden up the stairs to the main entrance of the house and the pool area. 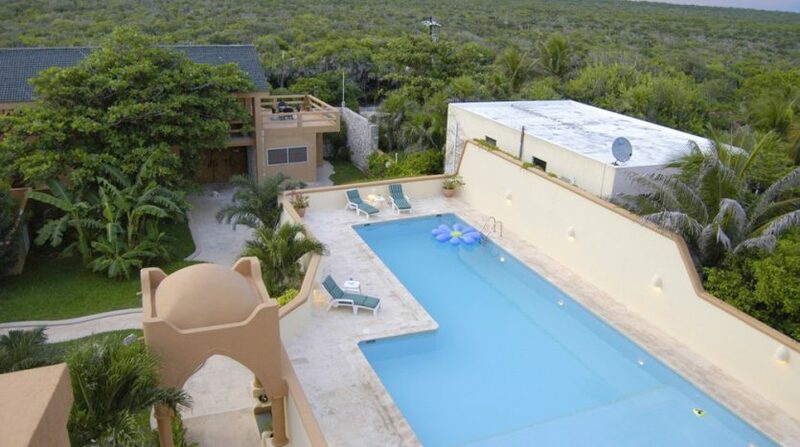 The 26’ x 60’ pool is surrounded by plenty of tiled space to lounge and entertain poolside. 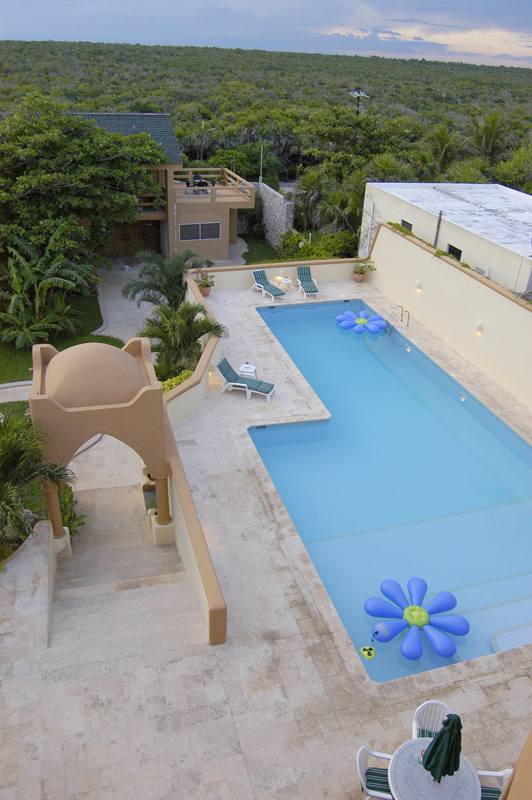 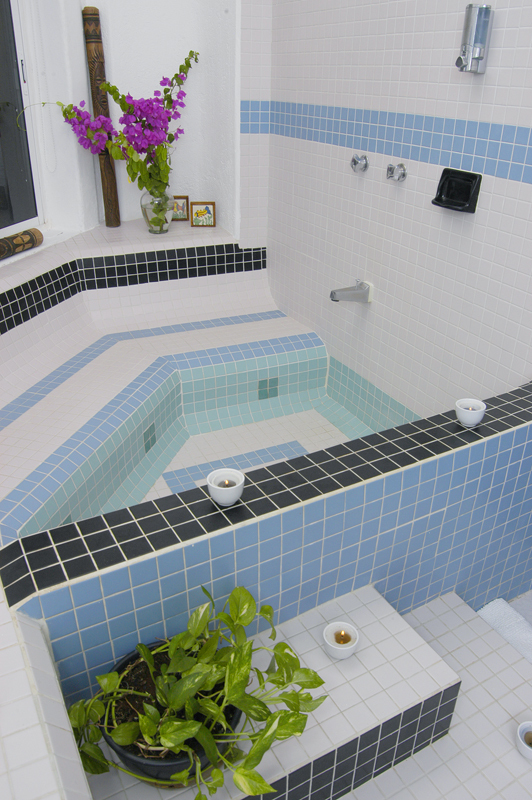 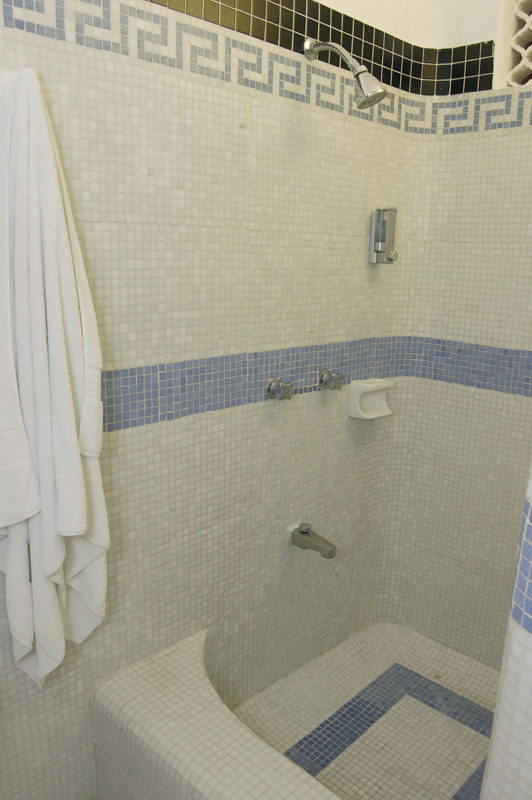 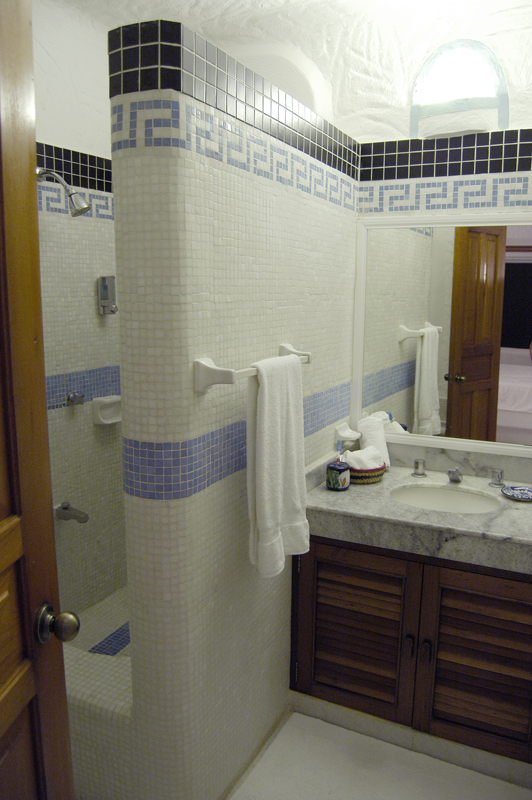 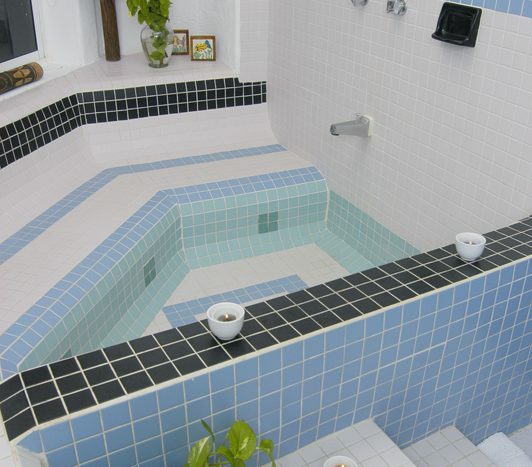 It is the largest private pool in the area complete with an outdoor shower. 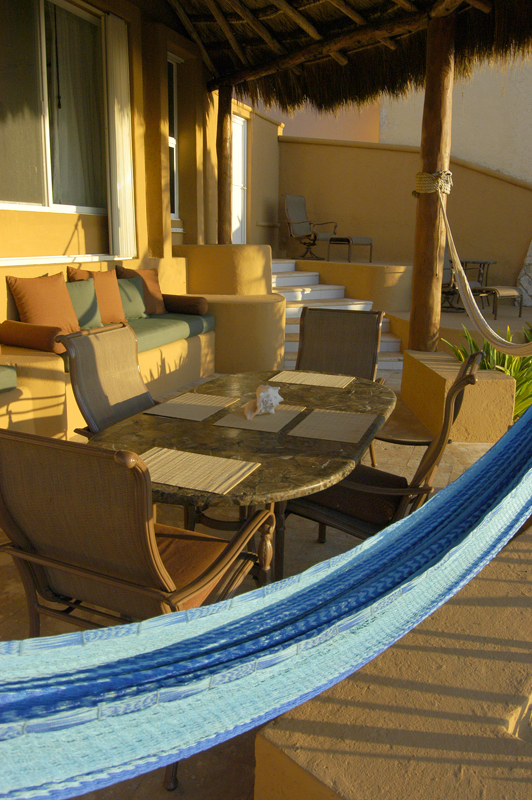 There is an elevated deck with sea views and an umbrella for shade. 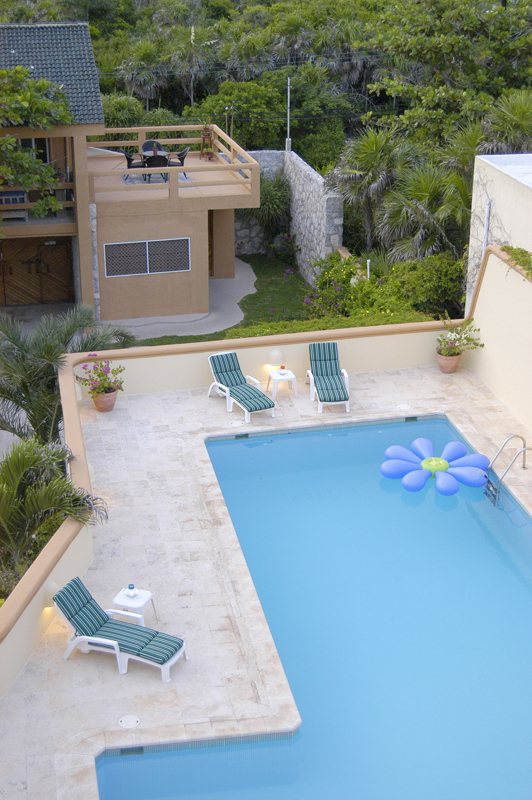 On the other side of the pool area is a walkway that leads to the seaside. 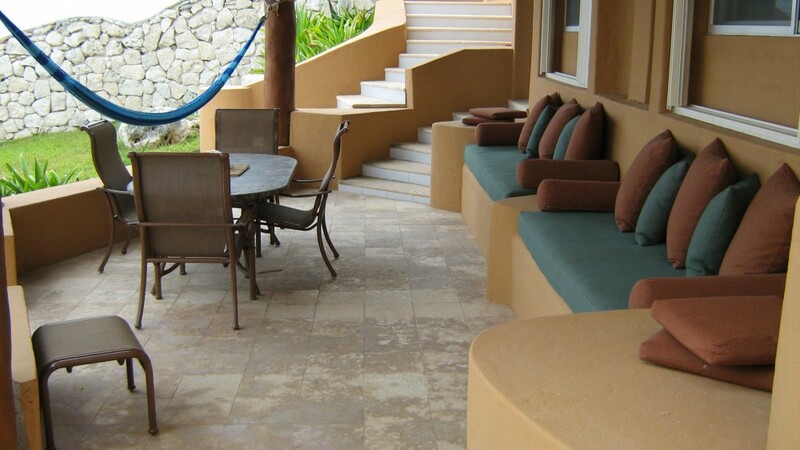 This is a covered walkway large enough for tables and chairs and perfect for entertaining. 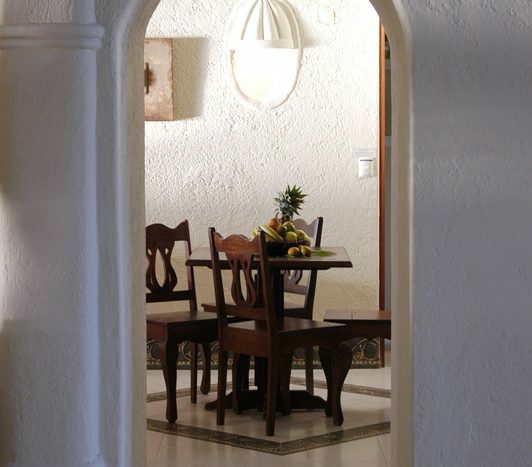 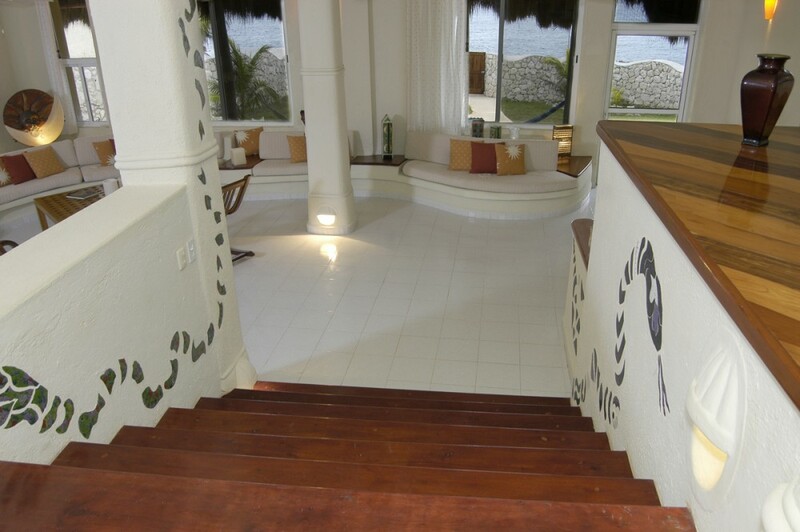 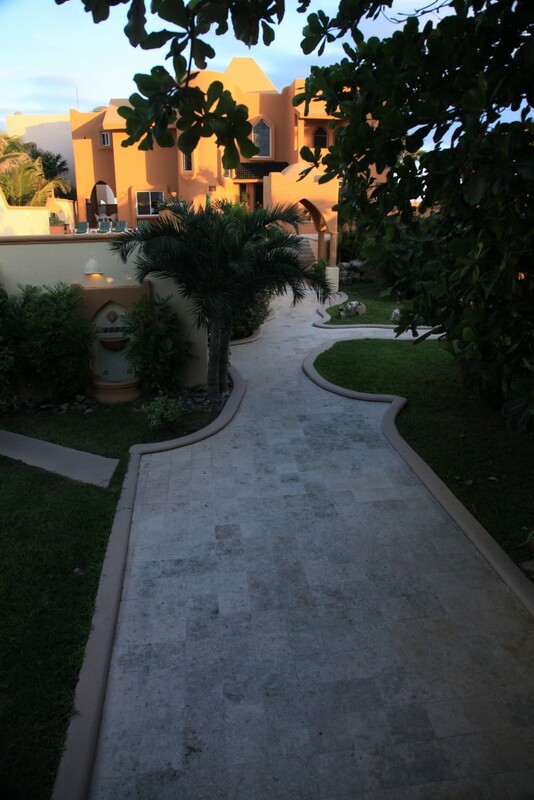 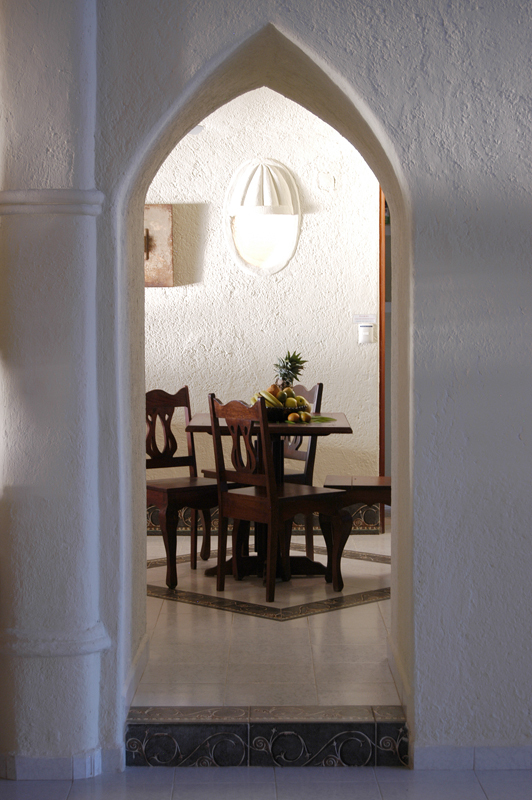 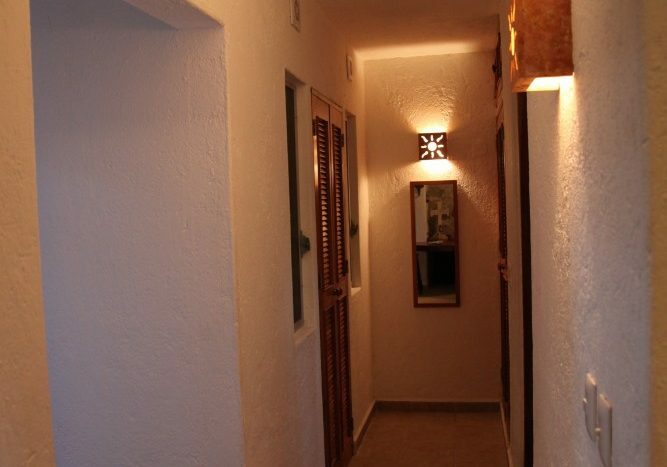 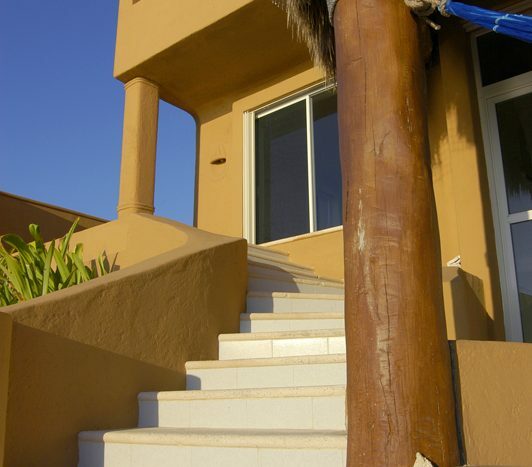 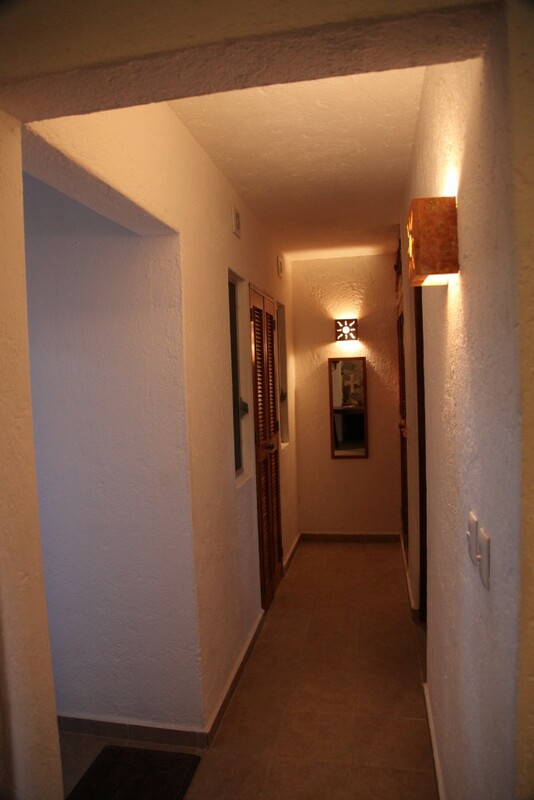 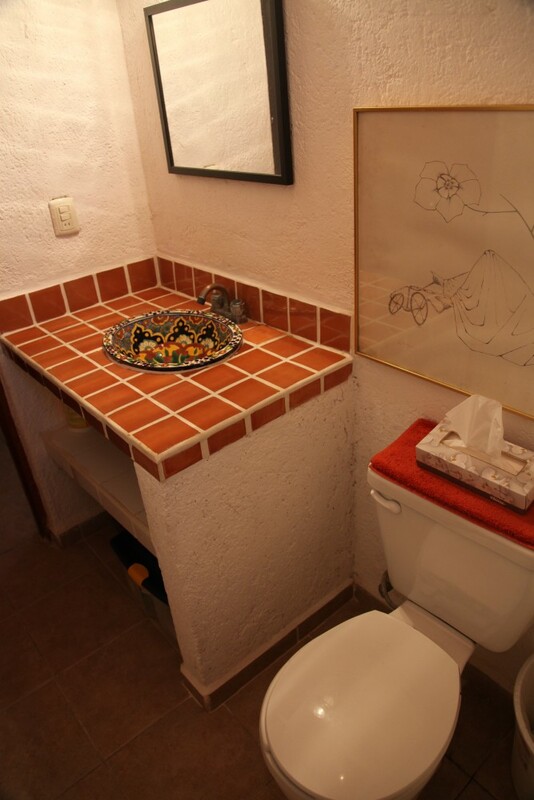 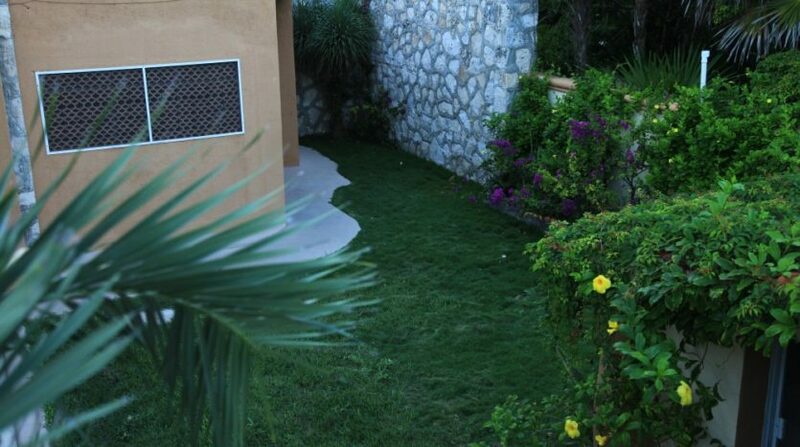 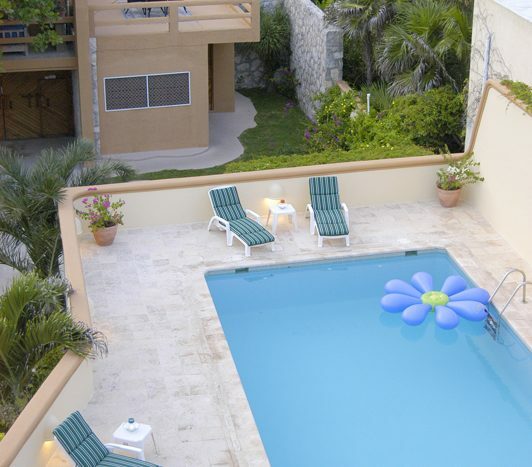 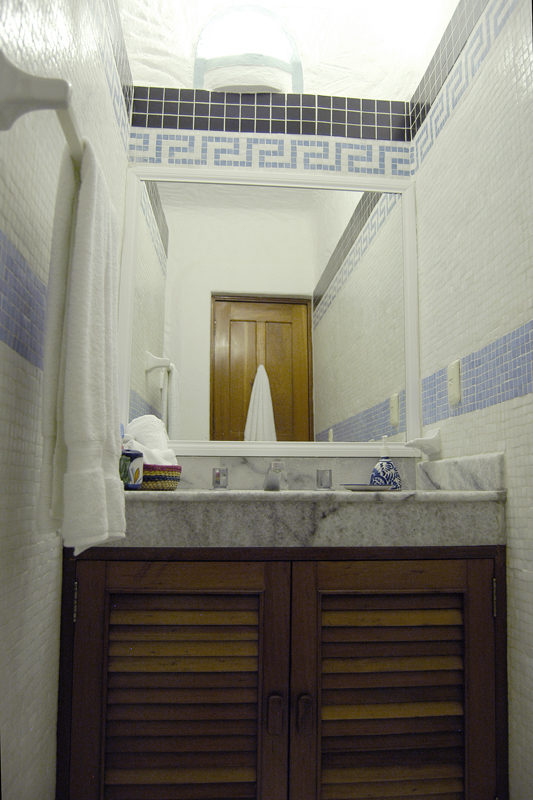 The walkway to the house, the pool area and the walkway to the seaside is all paved with conchuela tile. 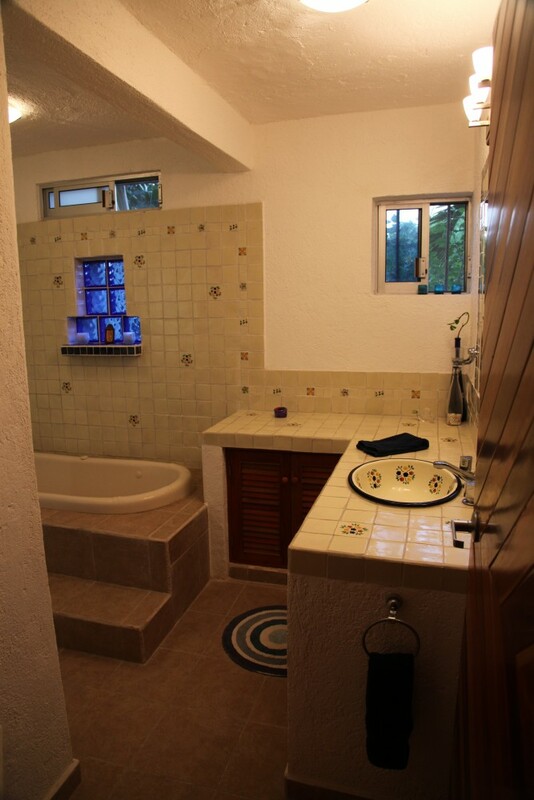 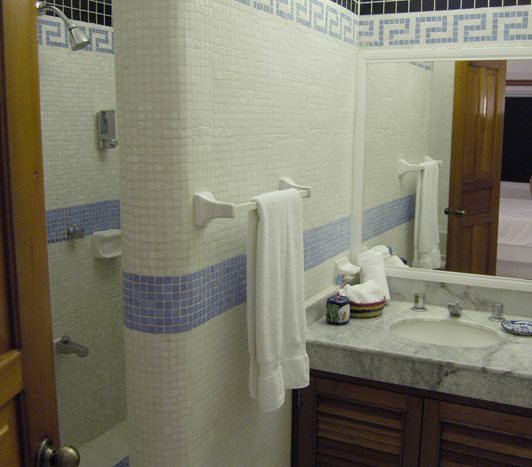 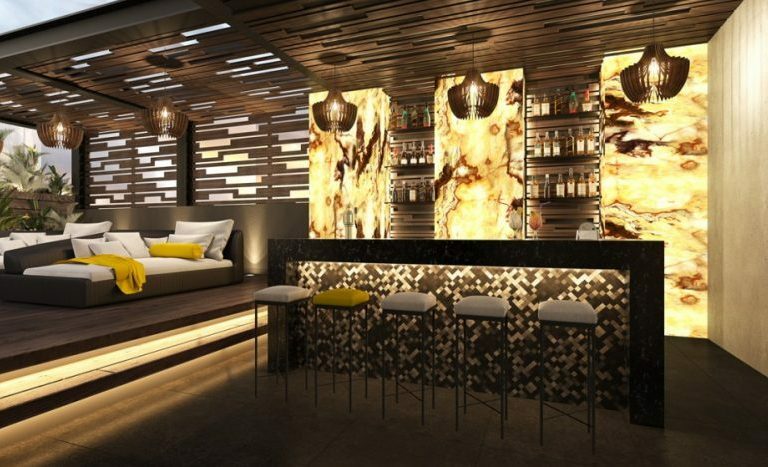 This is a very special tile from the coral inland in the state of Quintana Roo, Mexico. 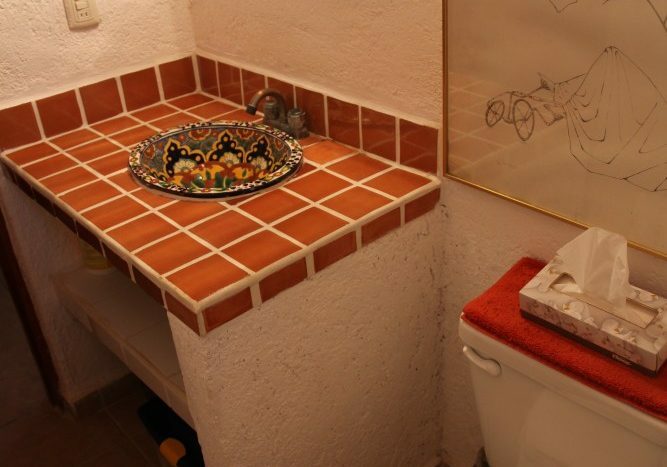 It is the only place in the world that has this special material to make this tile. 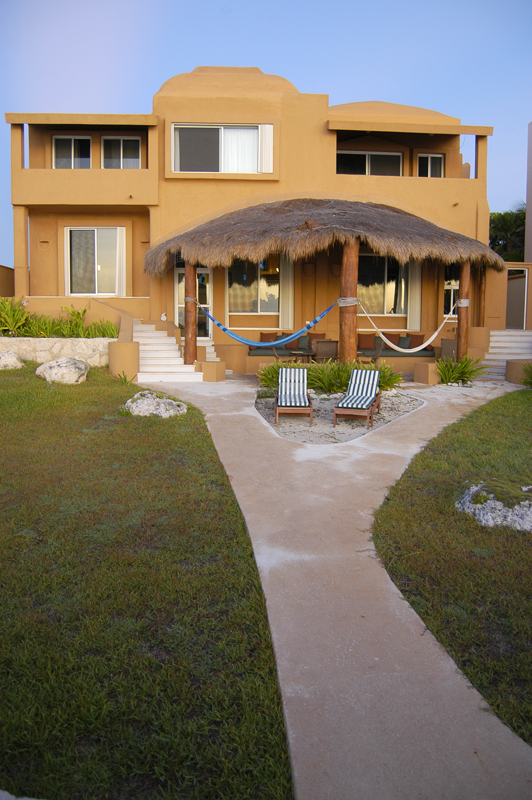 Contact me below for more information on this incredible Akumal Mexico beachfront house for sale. 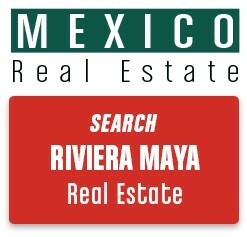 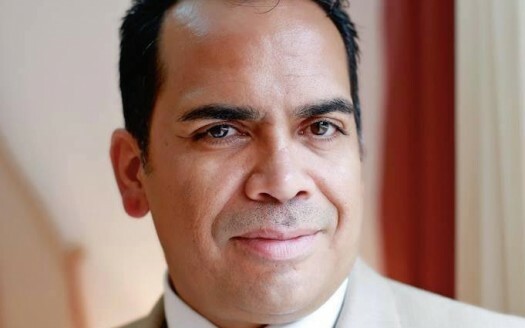 Additionally I am a Akumal real estate buyer’s agent.